One of the reasons why I wanted to blog was to motivate myself to improve my food photography skills. 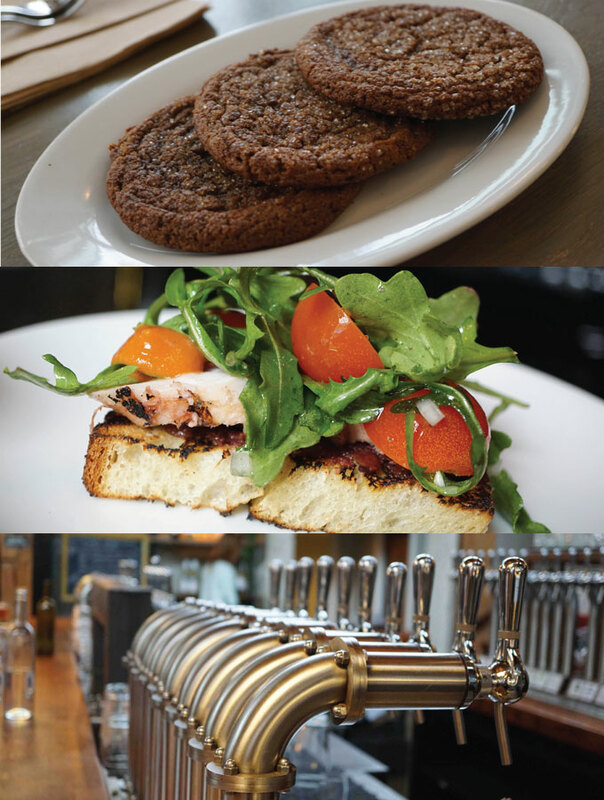 Therefore, I was excited to see that one of the events of Dine Out Vancouver 2015 was the Food-tography: A Culinary Photography Tour presented by Off The Eaten Track and Vancouver Photowalks. I signed up for one of the sessions and was eager to improve my photography skills. On the tour, we are able to take photos around the restaurant and enjoy some samples as well. We had a tour guide from Off The Eaten Track and a photography instructor from Vancouver Photowalks. I was using my Sony A6000 with 30mm macro lens on the tour and my iPhone 6 plus. The cost of the 2.5 hour tour was $73. 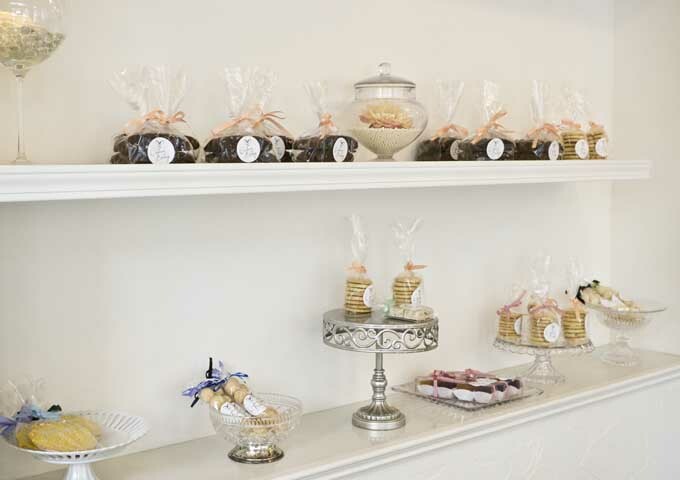 Cadeaux is such an adorable little bakery and not to mention very photogenic! 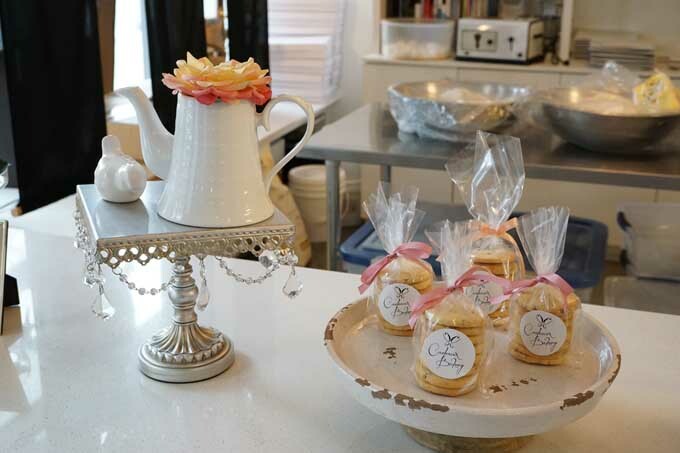 We got to sample their lemon meringue tart and ginger molasses cookie, which were all very delicious. 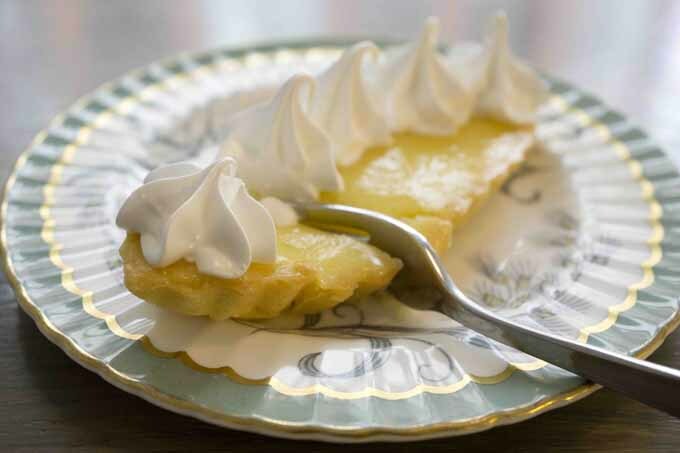 Lemon tarts are one of my favorite desserts, and I felt Cadeaux did a wonderful job with it. 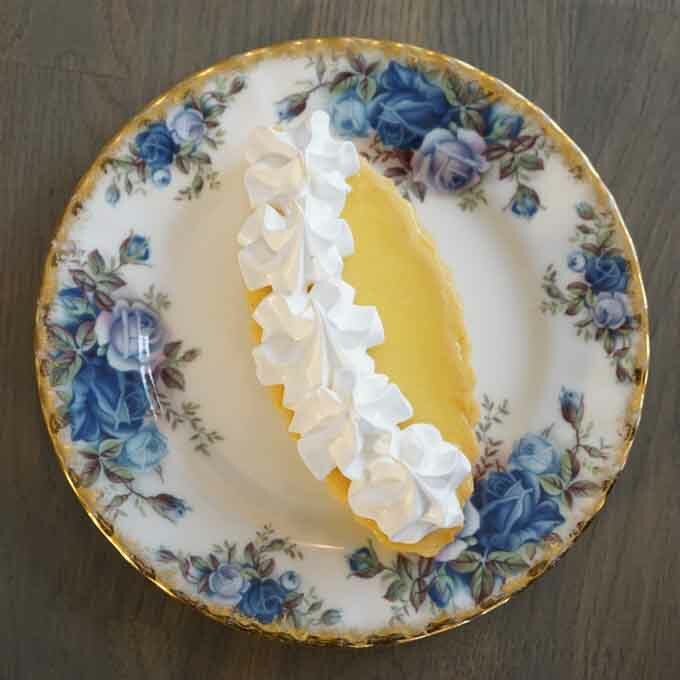 The tart crust was perfect in my opinion. The English china made for a cute presentation of the desserts. I also spotted very cute bourbon and lime truffles on their display. Chill Winston was the second stop of the food-tography tour. 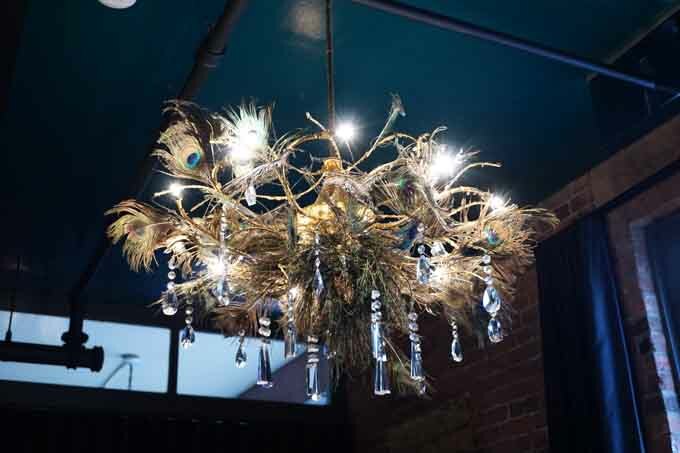 We were taken to the private Peacock room notably having a peakcock chandelier. 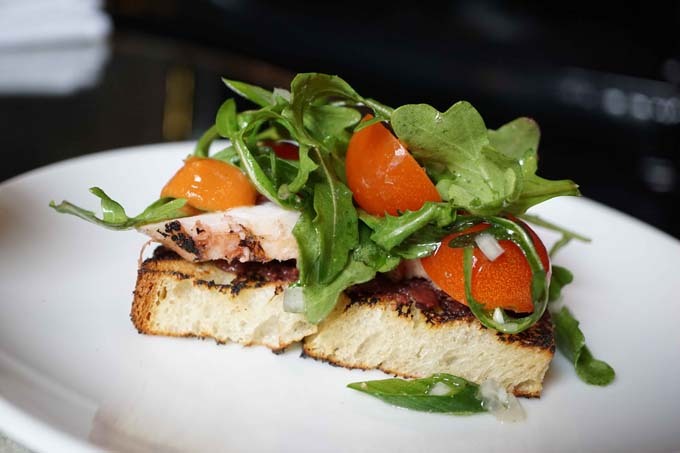 There, we sampled an octopus on crostini. At first, I thought that it would be an “adventurous” combo but it turned it really delicious. The octopus taste was not overwhelming to the overall dish and was balanced with the bread and vegetables. 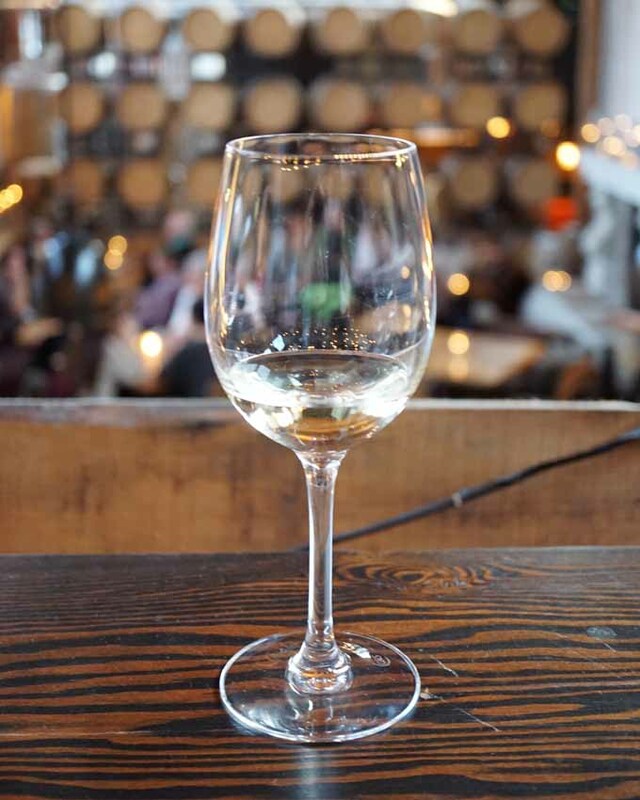 The final stop of the food-tography tour was the Vancouver Urban Winery. This place is so spacious and warm with couches, dim lighting, high top tables, and high ceilings. 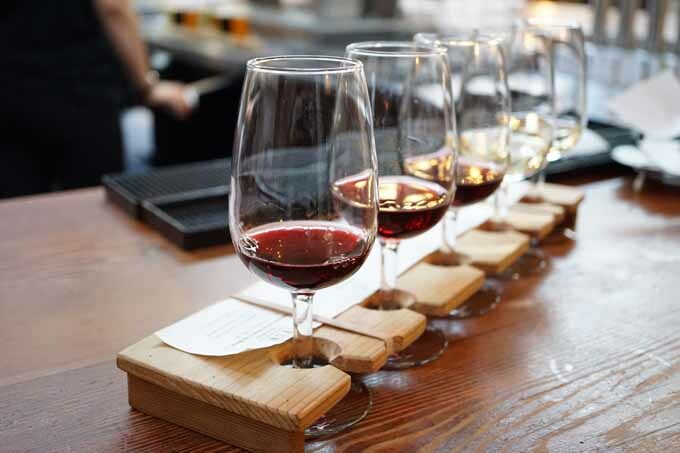 I enjoyed the vibe of the Vancouver Urban Winery. We got to sample some of their wine and the staff seemed quite friendly. It was a great end to such a fun tour! I had a great time on the tour: our tour guide was friendly and our instructor was knowledgeable. Best of all, I got sharpen my food photography skills! I would not consider myself a cream puff connoisseur. I have never been to Beard Papa’s nor would profiteroles be my first dessert choice at a dessert buffet. 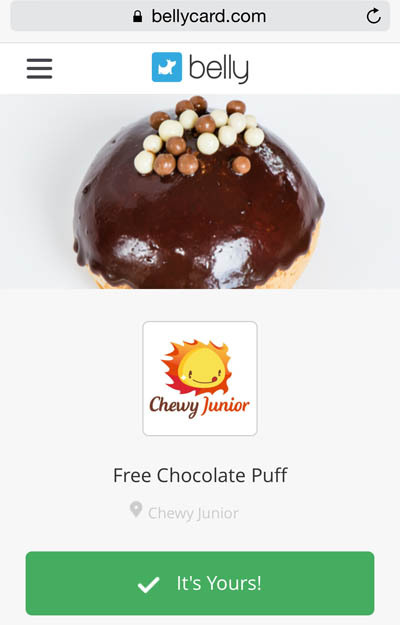 Therefore, I was eager to try out Chewy Junior when I saw that they were offering a free chocolate puff through the Belly App. I wanted to find out the allure of the cream puff. 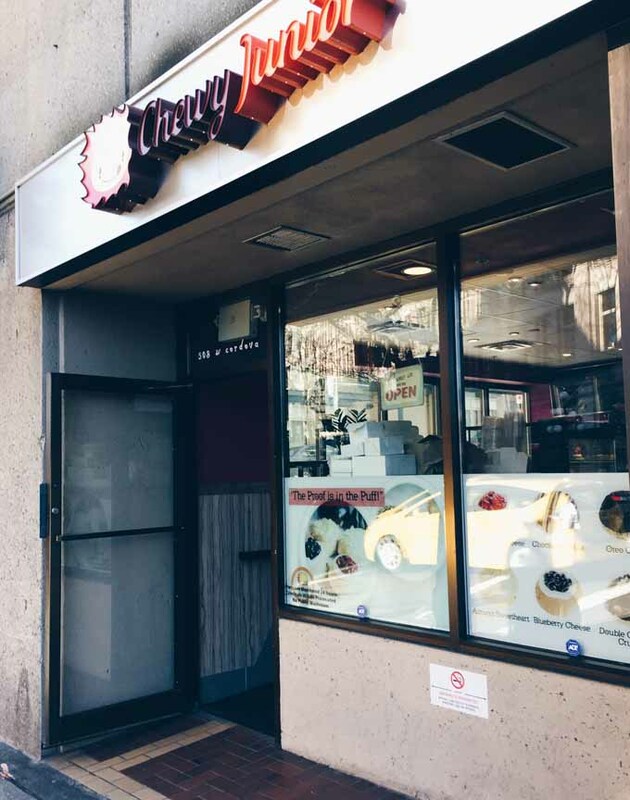 Chewy Junior is conveniently located near the Waterfront Station just outside of Gastown on West Cordova. Their puffs are described as being crispy on the outside, but soft and chewy on the inside. Their puffs range from $2.75 to $3.25 each and are baked rather than fried. Walking along West Cordova, I could smell the sweet scent of their bakery! Chewy Junior had no issue processing the free offer and I received the double chocolate crunch. I really enjoyed the puff: it was crispy when I first bit into it, and then I found the inside to be a light and delicious cream. I found the cream to be not overly sweet, which was pleasant. The owner mentioned to me that their puffs are fresh every day and made on-site. He explained that Chewy Junior is originally from Singapore and there are other locations in Asia. 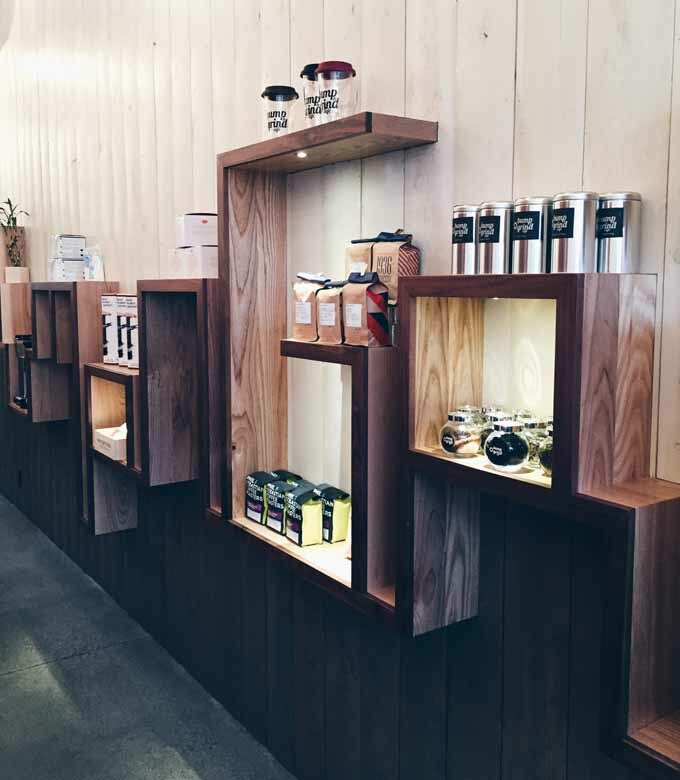 This Vancouver location is their flagship store in North America, and they have hopes to expand in this region. The owner was very eager to hear my thoughts on the puff, and he was happy to hear that I did enjoy it. I went home that day longing to try another one of their puffs, so I returned the next day. This time, I purchased their new matcha nippon as takeout. 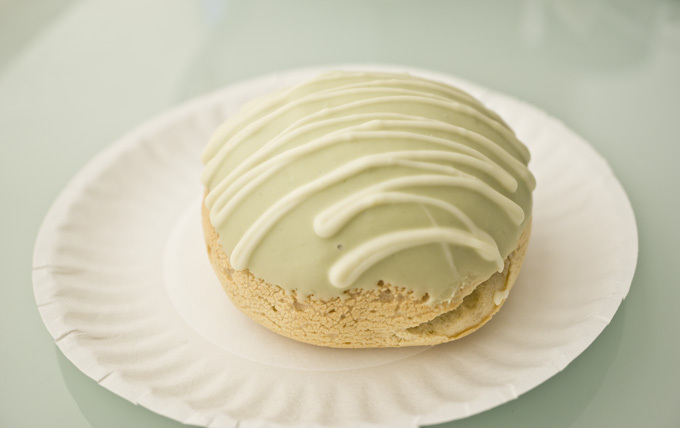 The matcha nippon was again a very tasty treat and the green tea flavor was just right. I found it very satisfying as an afternoon snack and found it to be surprisingly filling. The Chewy’s Junior experience was overall positive with their puffs being delicious and also a somewhat “healthier” indulgence. 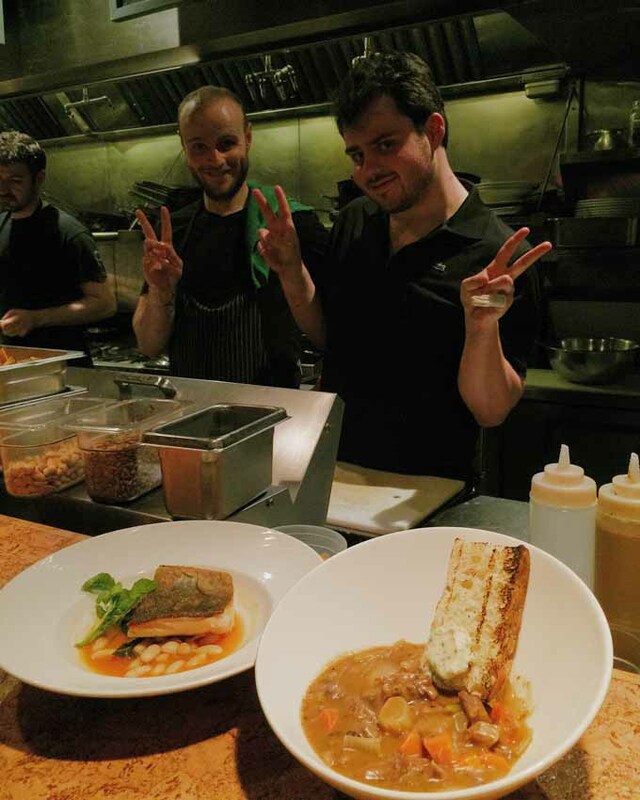 It was a girl’s night out and my friend and I ventured to Edible Canada for their Dine Out Vancouver 2015 $28 per person dinner menu. 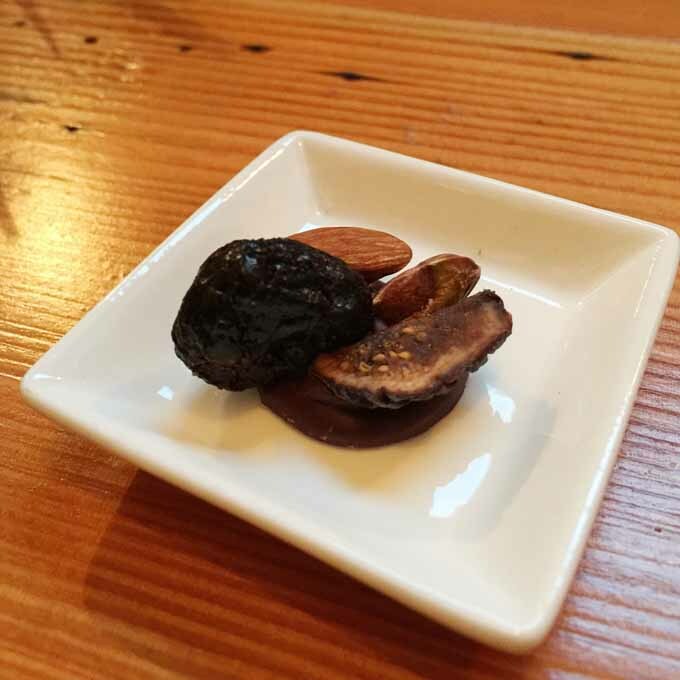 My friend had previously enjoyed dining at Edible Canada and she thought it would be fun to do Dine Out there as I had never tried out their food. While we were standing at the entrance waiting for our table, I had a chance to talk to the chefs since they had an open concept kitchen. They happily explained to me what dish they were preparing and I got to see them in action. It was fun when they quickly posed for a photo! For the first course, my friend enjoyed the braised smoked beef tongue with toast, pickled onions, lardo, and field greens. 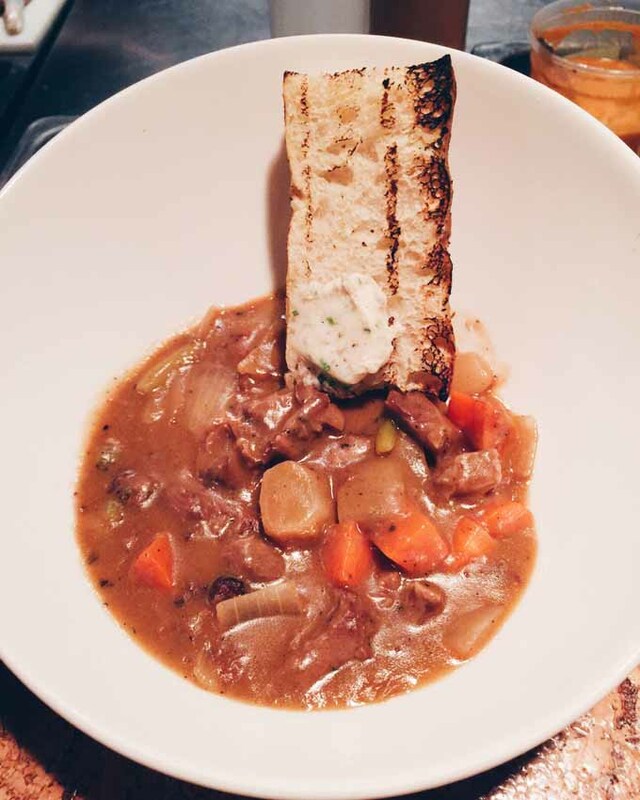 My friend loved her Merrit yak stew main course with salsify, root vegetables, bread and bone marrow butter. It was a hearty dish perfect for a winter night. 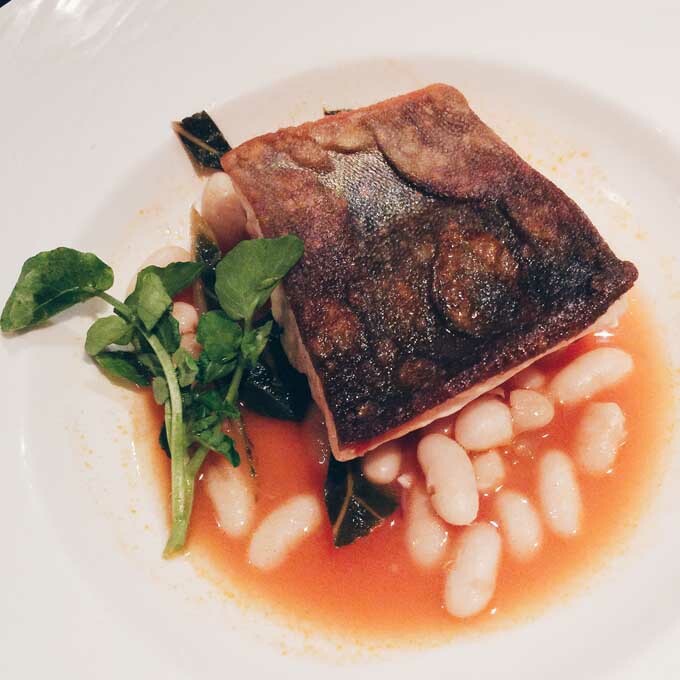 The Cascade Mountain arctic char with tomato fume, cannellini beans and collard greens was delicious. 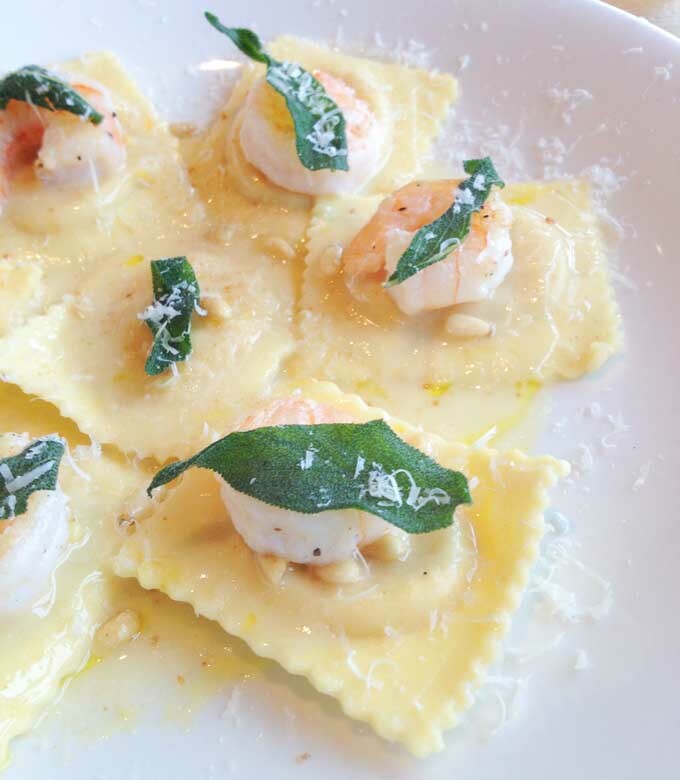 Simple, elegant, tasty and ocean wise! 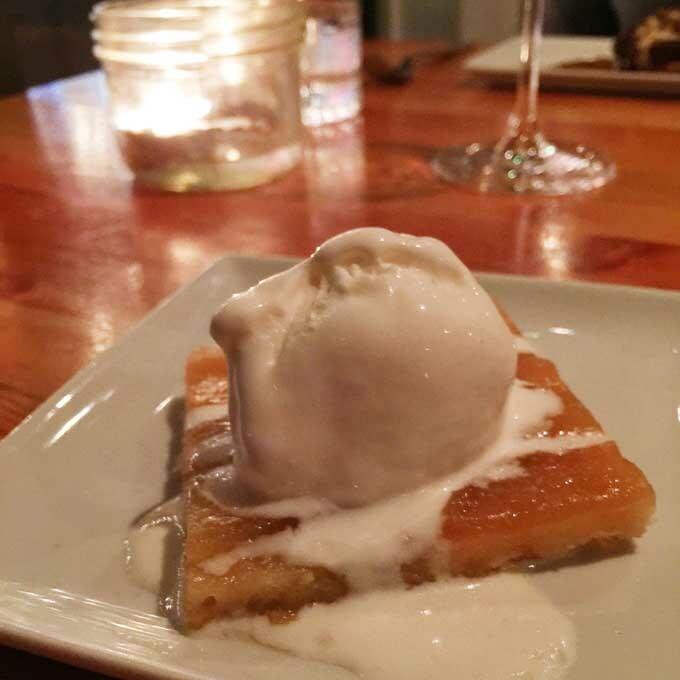 We finished off with Okanagan Apple Tart Tatin with Earnest vanilla ice cream. This was a simple and not overly sweet dessert. You cannot go wrong with a pairing with Earnest ice cream. 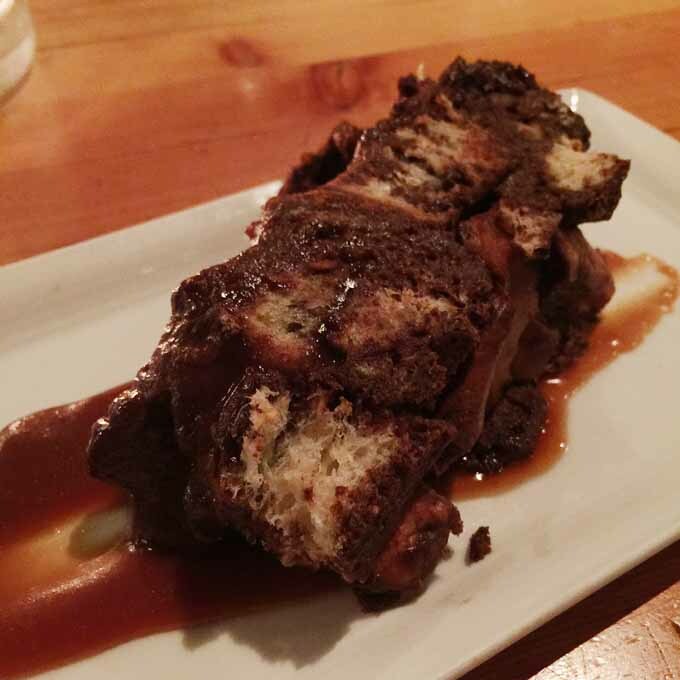 We loved the chocolatey goodness of chocolate bread pudding with Canadian rye caramel. A wonderful last course to a terrific meal. We really enjoyed the service as staff came by and checked on us throughout the meal. I appreciated our server as well, who helped me to take some of our dishes to the bar so that I could take photos of them under better lighting. This was an overall solid dining experience at Edible Canada, and I look forward to returning for another amazing experience! The Bump n Grind Cafe has now opened their second location in the vibrant community of South Granville. 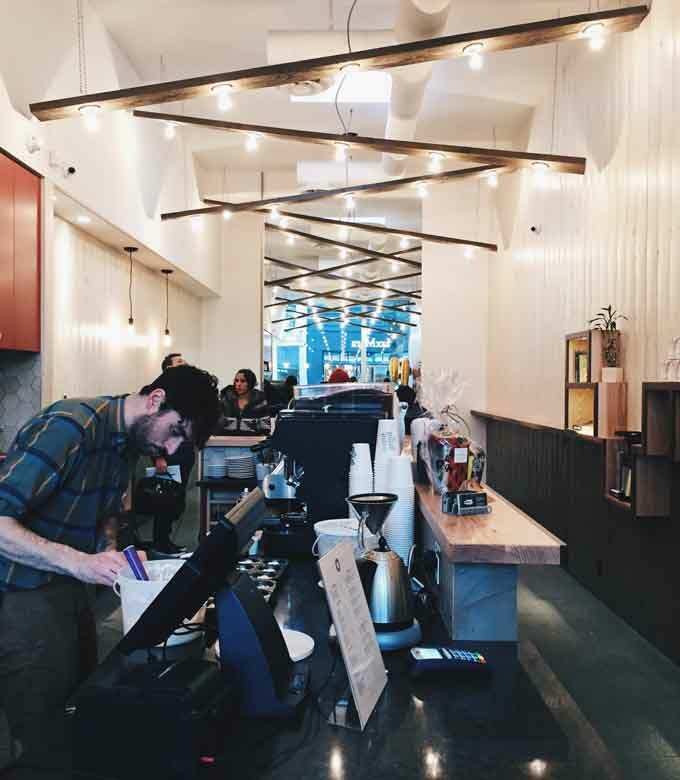 I was very fortunate to have been invited to their grand opening media event and had a chance to learn more about this Vancouver-based independent specialty coffee house. 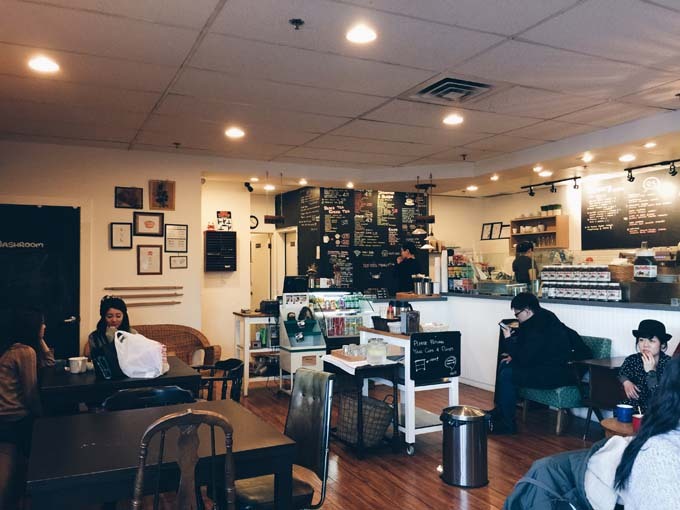 Bump n Grind is a multi-roaster cafe, where owners Cheryl and Kyle Wright bring best handcrafted coffee beans roasted from across Canada. 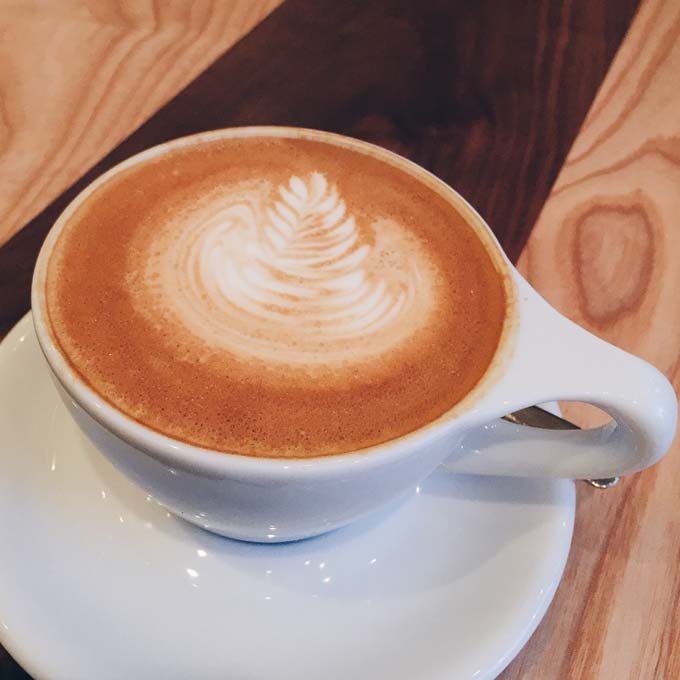 They also rotate coffees on a weekly basis so that customers will never be bored. 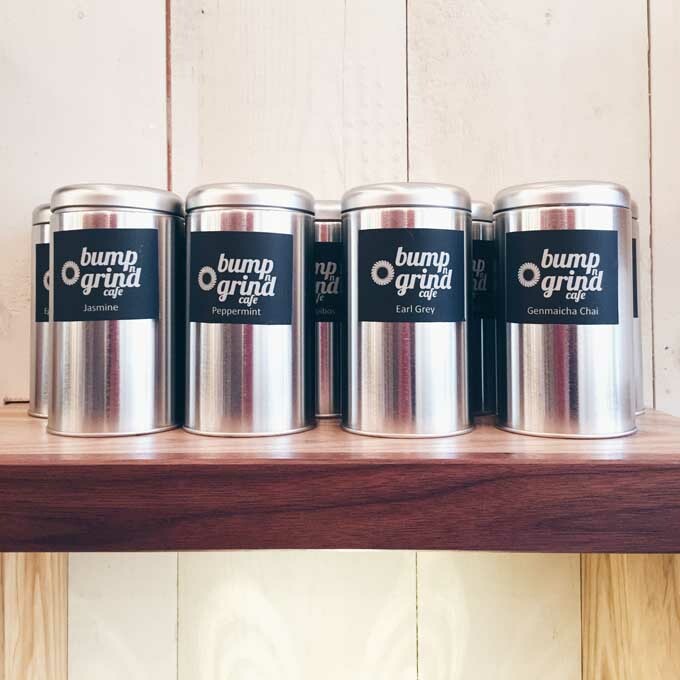 Bump n Grind also offers alternative brewing methods, such as Pour-over coffee, Aeropress, and French press coffee. 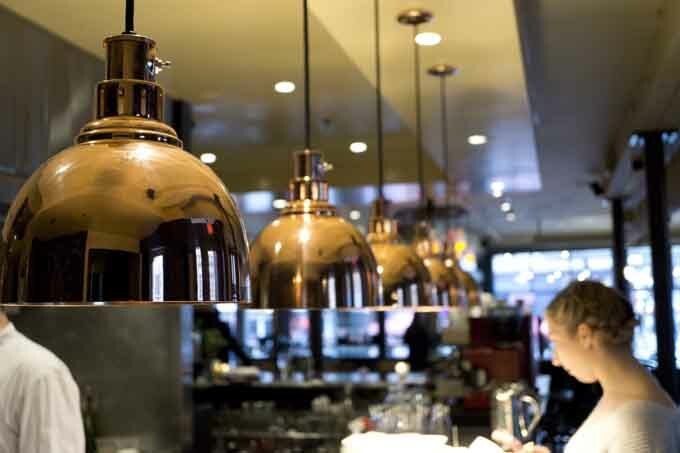 As I entered the cafe, I was drawn to the dramatic lighting fixtures that suspended from the ceiling. The overall design of the cafe is minimalist with wood accents. There is even a customized shelving display that spell out the cafe’s name. Can you see some of the letters in the photo below? One of the signature drinks of the night was the almond chocolate gibraltar. The presentation of the drink is beautiful and it really made me think that coffee is really an art! The taste of the drink was bitter from the espresso and sweet from the chocolate – kind of a ying and yang combination. Unfortunately, this drink is currently not on the regular menu. I am happy that I had the chance to try it! 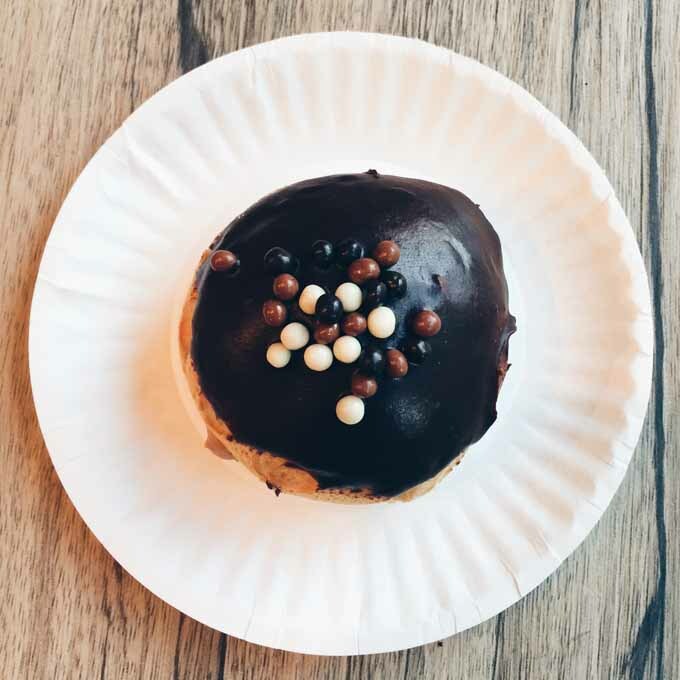 Bump n Grind cafe is known for their delectable baked foods and I am so glad that I got a chance to try them out! 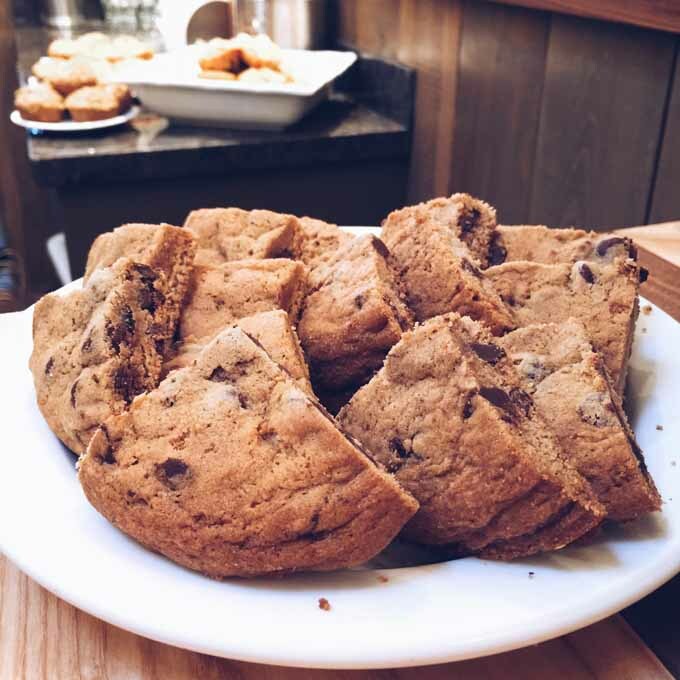 They are famous for the Mookie, which is a mix of a muffin or a cookie. I enjoyed the light and fluffy texture. 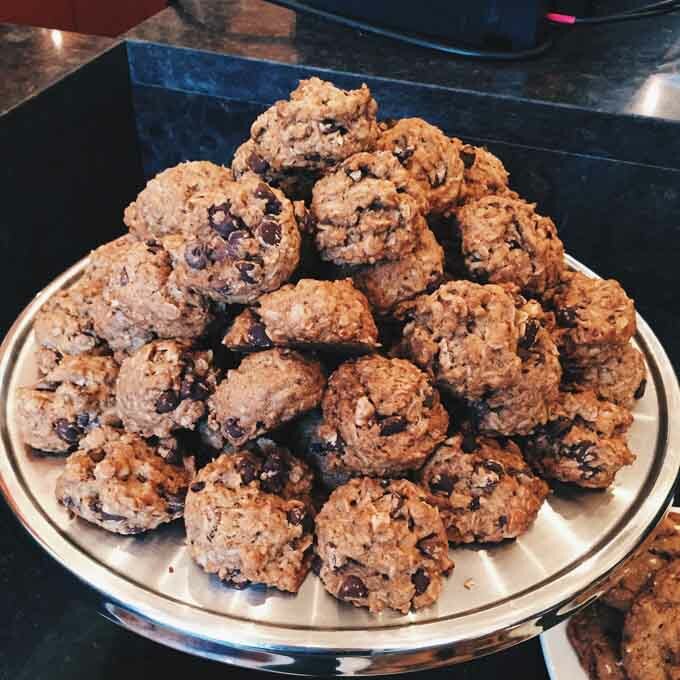 It is dairy-free and made of oats, coconut flakes, dark chocolate, walnuts, whole-wheat flour, canola oil, soymilk, brown sugar, dinnamon and nutmeg. They also have the matcha green tea brownie, which they call “a marriage of east and west.” It is made of authentic Japanese matcha powder, eggs, flour, butter and white chocolate. The suggested pairing for the brownie is a citrus sencha, which I found to be delightful. 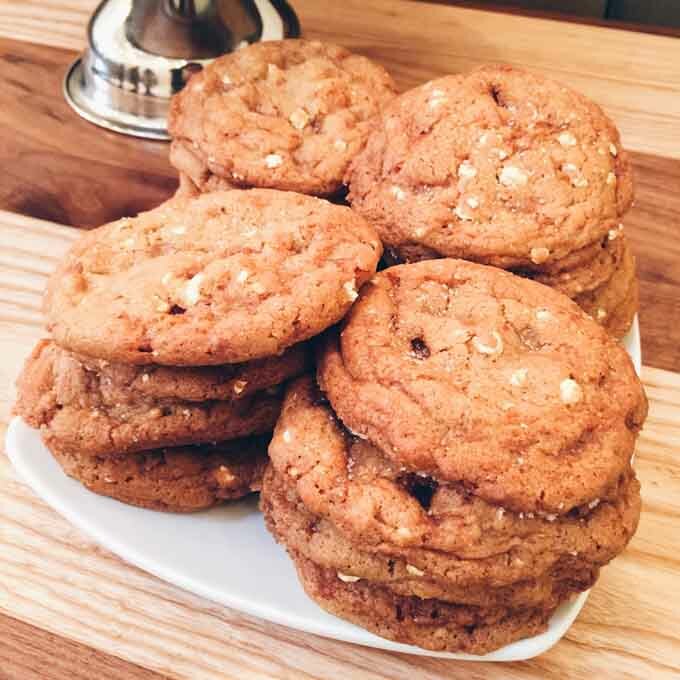 Bump n Grind offers a tasty selection of cookies as well. 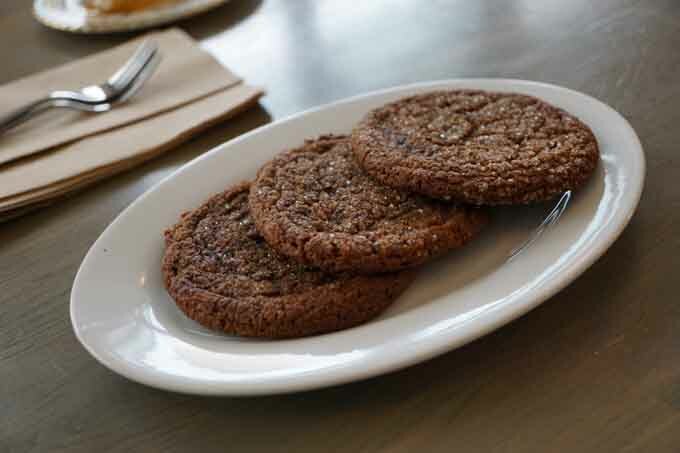 Chocolate chip cookies are bound to please! 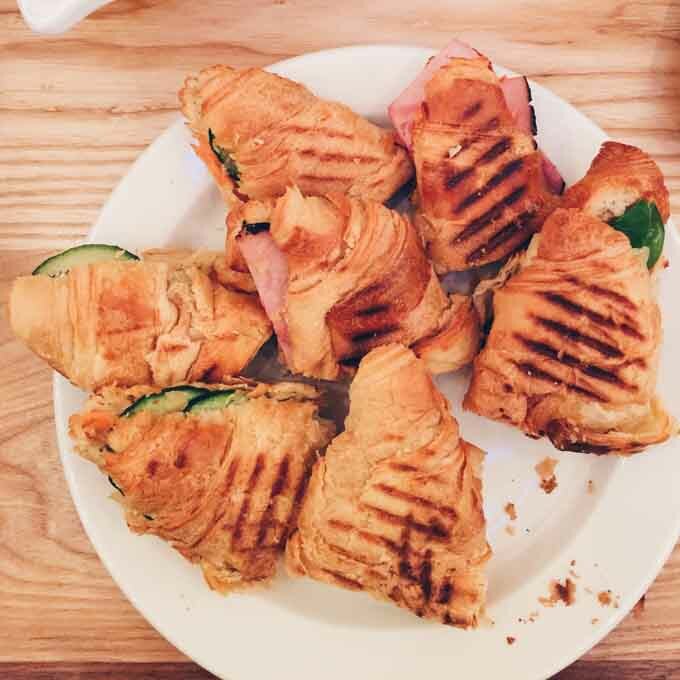 Bump n Grind also offers three types of croissant as part of their lunch menu: ham and cheese, BLT, and veggie. I admit that I had several of these croissants because they were simply delicious! The croissants were toasted perfectly and I found myself very addicted to them. They also serve loose leaf tea, including organic Earl Grey and Williamette peppermint. I enjoyed the media event overall and I could tell owners Cheryl and Kyle Wright are passionate about their cafe. 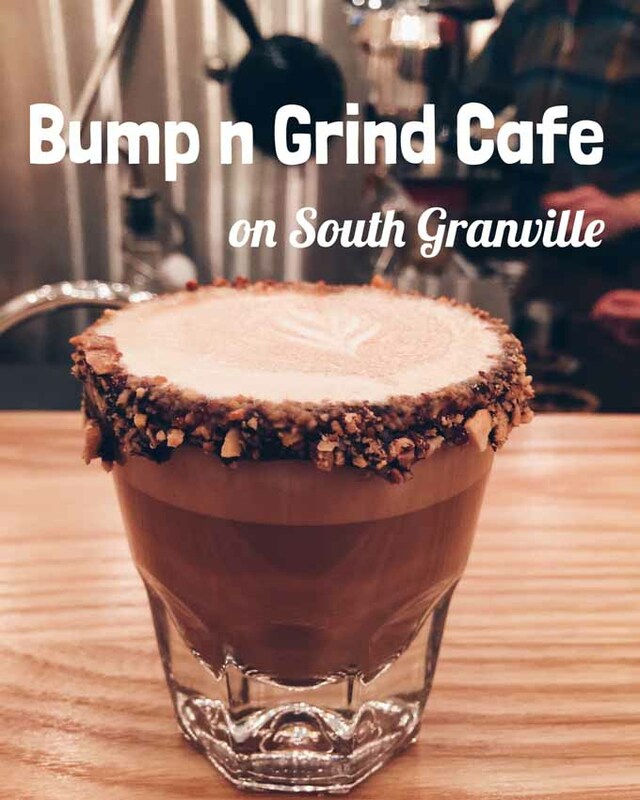 If you are in the South Granville, consider popping by the Bump n Grind cafe for some great coffee and sweet treats. I am looking forward to my next visit to Bump n Grind cafe. 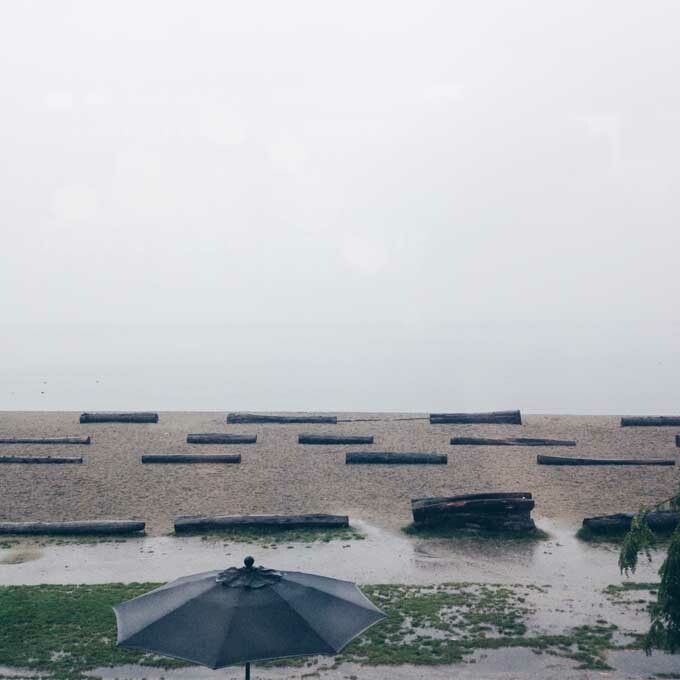 On a cloudy Vancouver afternoon, we visited Cactus Club English Bay. We arrived past 1 pm on a weekday so it was not very busy. As it is winter, sitting on their gorgeous patio is not an option, but the view from the second floor dining area is quite nice even on a foggy day. 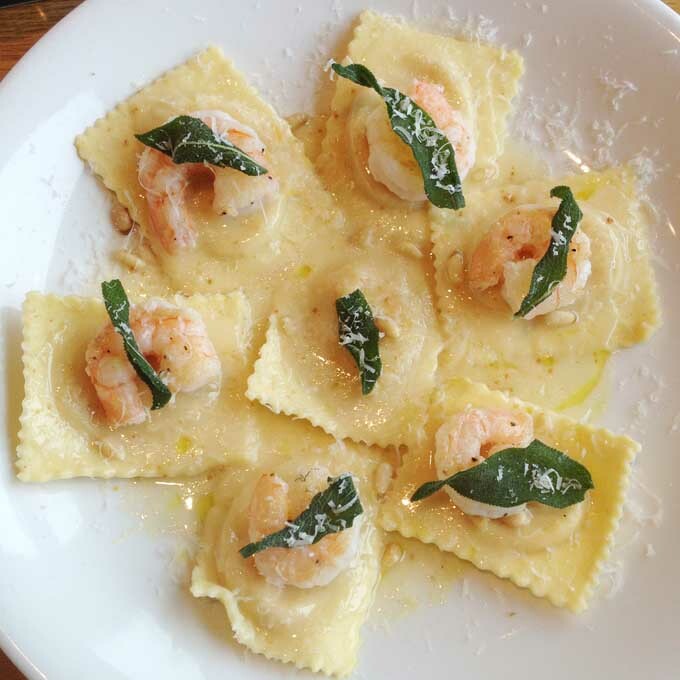 I had one of Rob Feenie’s signature dish: ravioli and prawn trio – artisan made butternut squash and mascarpone ravioli, jumbo prawns, truffle butter sauce, and pine nuts. This dish is just awesome! It is nice and creamy with the butter sauce and overall delicious; I would recommend it! 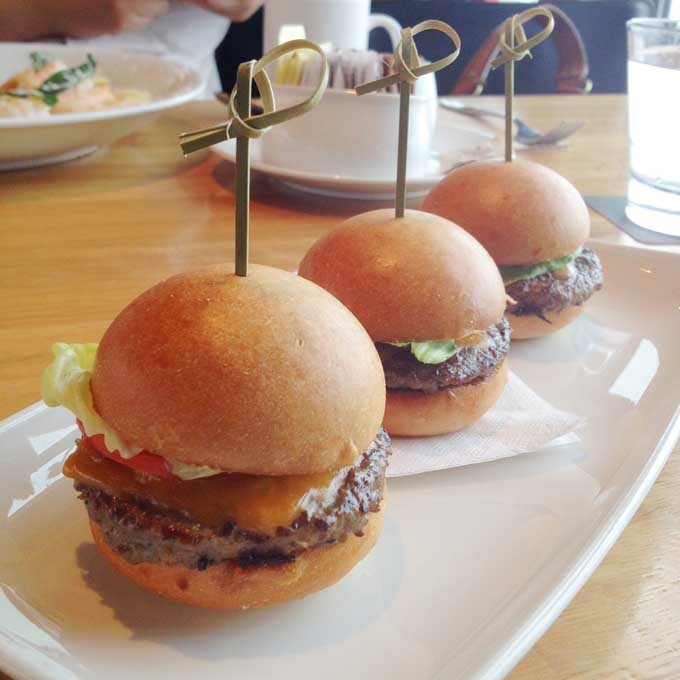 We also had the mini burgers – certified angus beef, cheddar, alder smoked bacon, and red pepper relish. The patties were nice and juicy and the burgers were nicely presented overall. This was another solid dining experience from Cactus Club Cafe. Our server was attentive and the staff seemed friendly throughout. I would return to Cactus Club in the future for the terrific food! 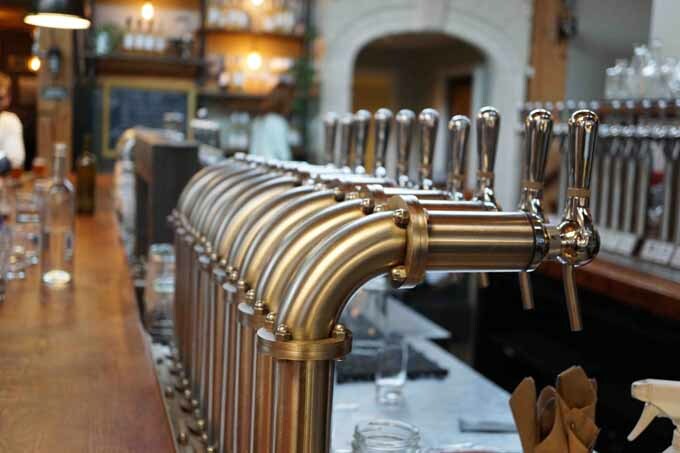 Banana Leaf is one of my favorite restaurants in Vancouver, and I have visited all their locations. 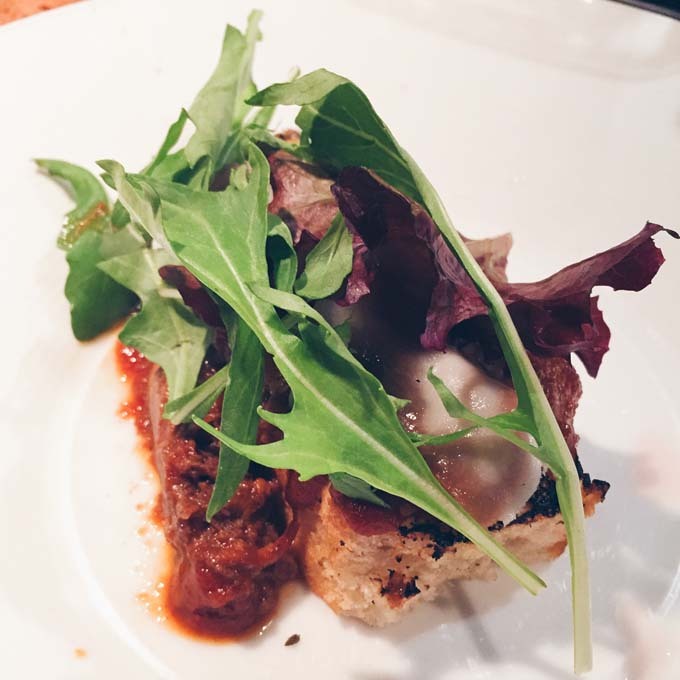 On this occasion, I tried out their Dine Out Vancouver 2015 lunch menu, which included 7 courses for only $18. 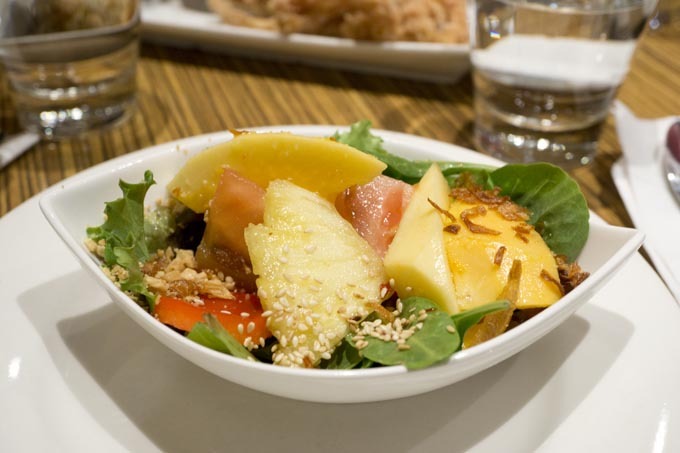 The papaya and pineapple green asian salad was a refreshing appetizer. It had shredded fruit salad with cucumber, carrots, and jicama. They are tossed in kerabu fish sauce and sweet and sour dressing, then served with crushed peanuts, sesame seeds, and shallots. 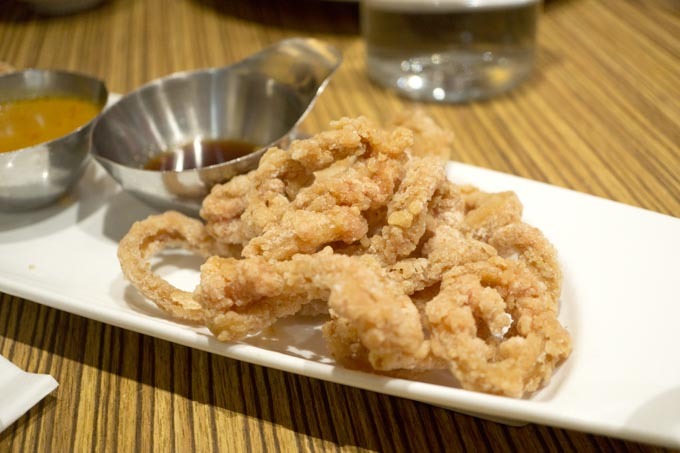 I love the Nyonya Calamari rings with sweet chilli sauce. They were very crispy! 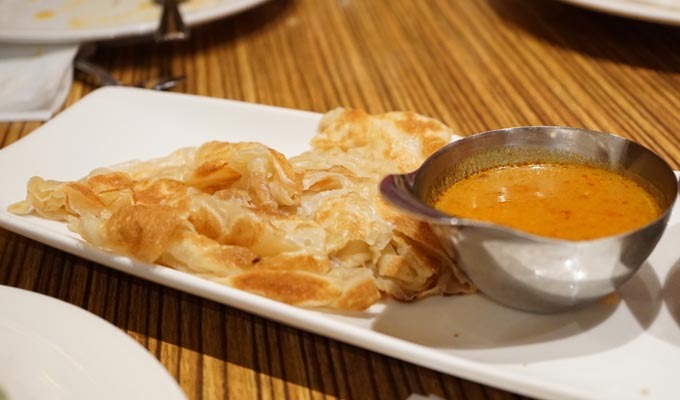 The roti canai is my regular must-have, and luckily it came part of the Dine out menu. It is flaky layered naan bread served with coconut curry sauce. Anyone who goes to Banana Leaf needs to order this! 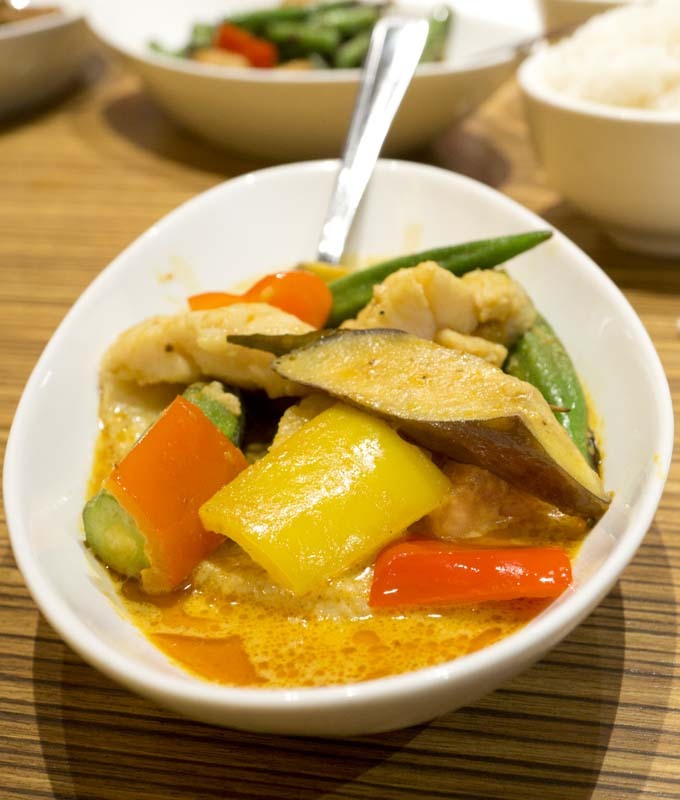 The assam curry fish fillet with mixed vegetables had excellent coconut and curry flavor. 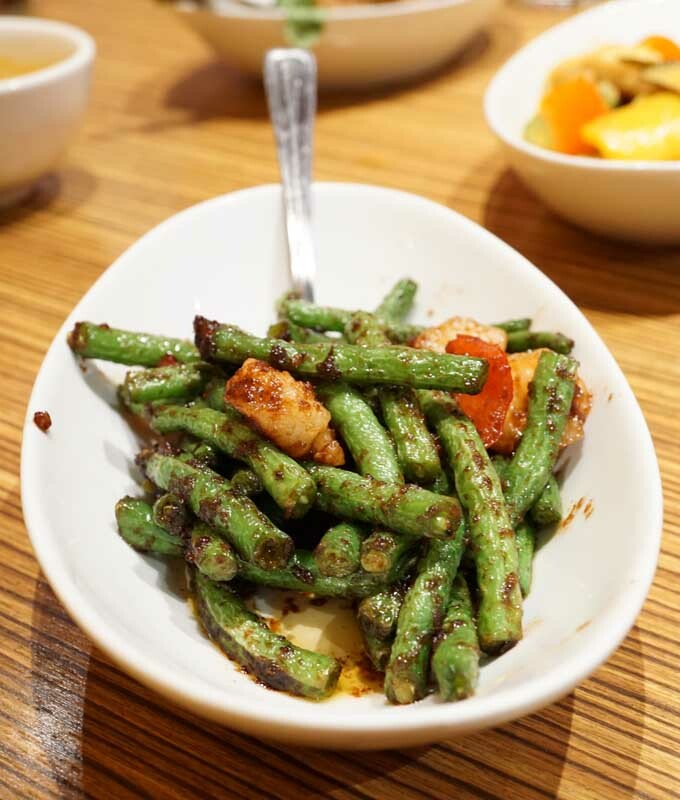 The sambal green beans are another one of my favorites. The beans are stir-fried with shrimp and tomatoes and tossed in chili, garlic, and dried shrimp paste. 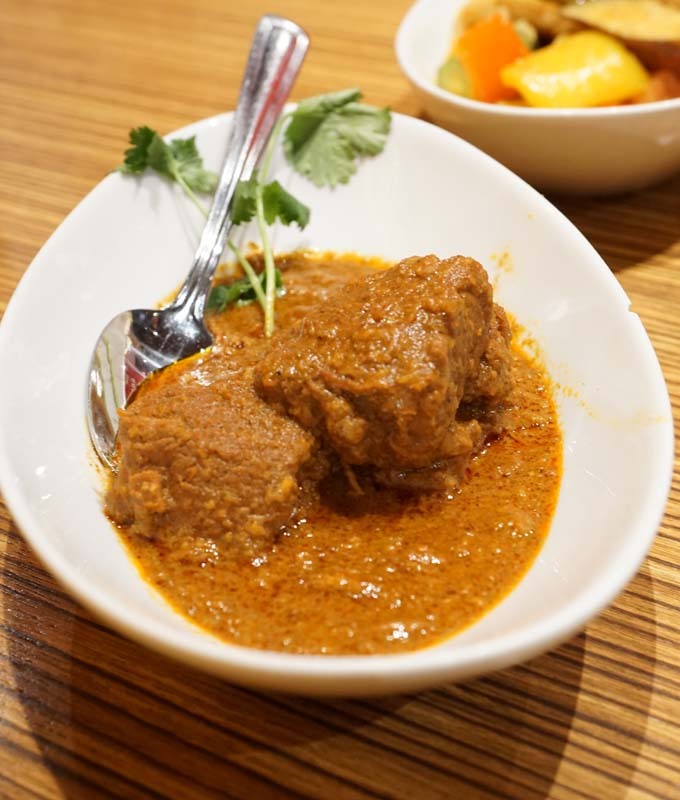 You cannot go wrong with the rendang beef curry – a rich Malay curry with boneless, lean beef stewed in spicy coconut gravy. The pisang goreng with ice cream and crushed peanuts were a real treat! 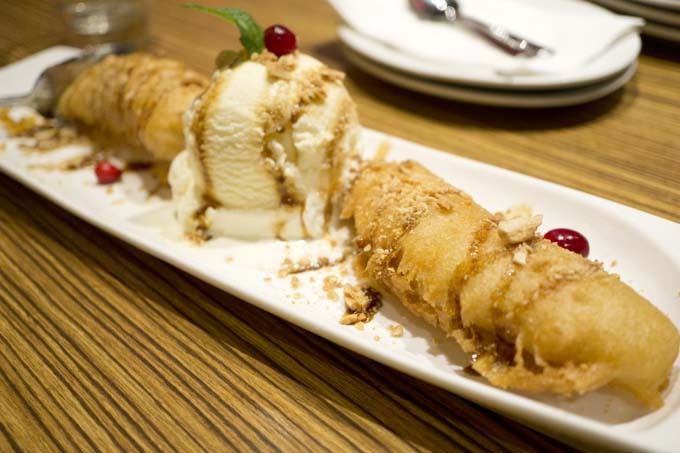 It’s basically deep-fried banana with ice cream. I enjoyed the presentation of this dish! I really loved this Dine Out experience at Banana Leaf. You must have a minimum of 2 people to order the Dine Out menu, so the photos reflect portions for 2 people to share. The portions were reasonable and we left feeling very satisfied from the meal. I highly recommend Banana Leaf for Dine Out or for any occasion! 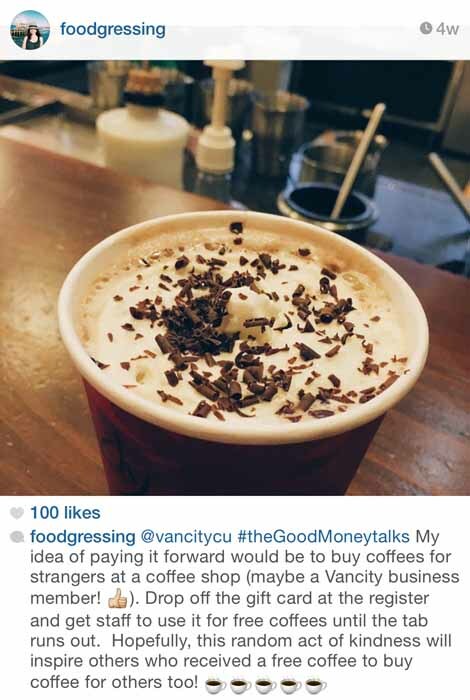 Over the holidays, Vancity held #thegoodmoneytalks contest where people could submit ideas on how to pay it forward. As a foodie, I know that food is a great way to connect with people. My idea was to buy coffees for strangers at a coffee shop in hopes of spreading good cheer. I was excited to be one of the lucky three people who won! 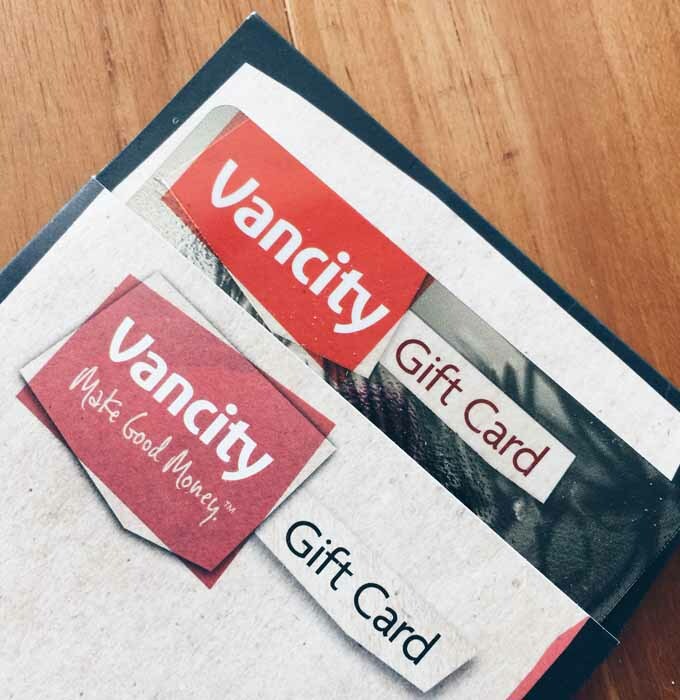 Vancity provided me a $125 Vancity Visa gift card to carry out my idea. 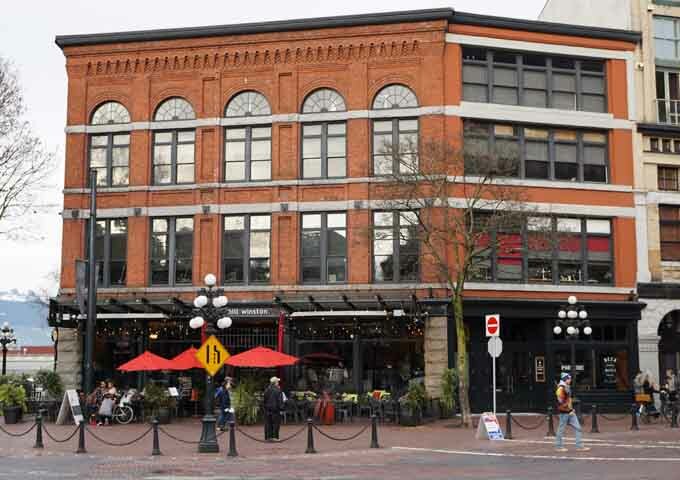 The coffee shop that I chose to pay it forward was East Van Roasters, which is located below the historic Rainier Hotel in Vancouver’s Downtown Eastside. 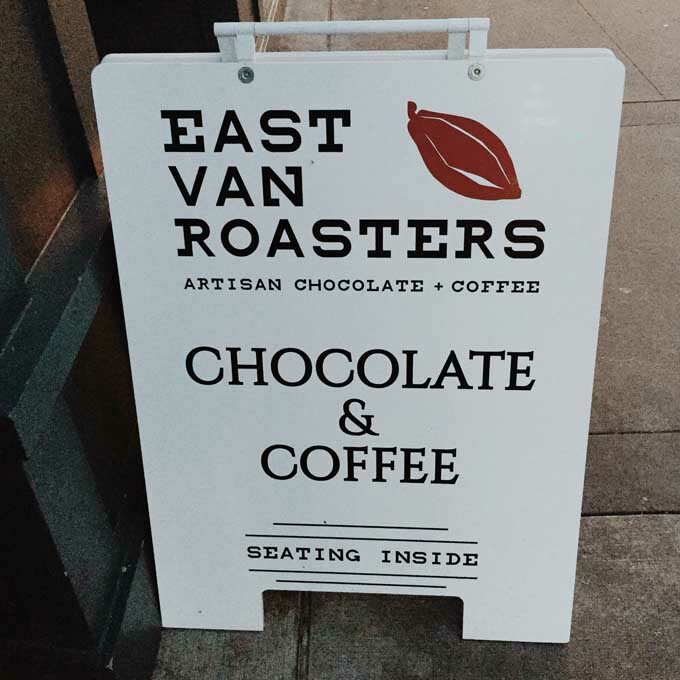 East Van Roasters is a non-profit that helps women recovering from addiction and staying at the Rainier Hotel by providing them employment and training. 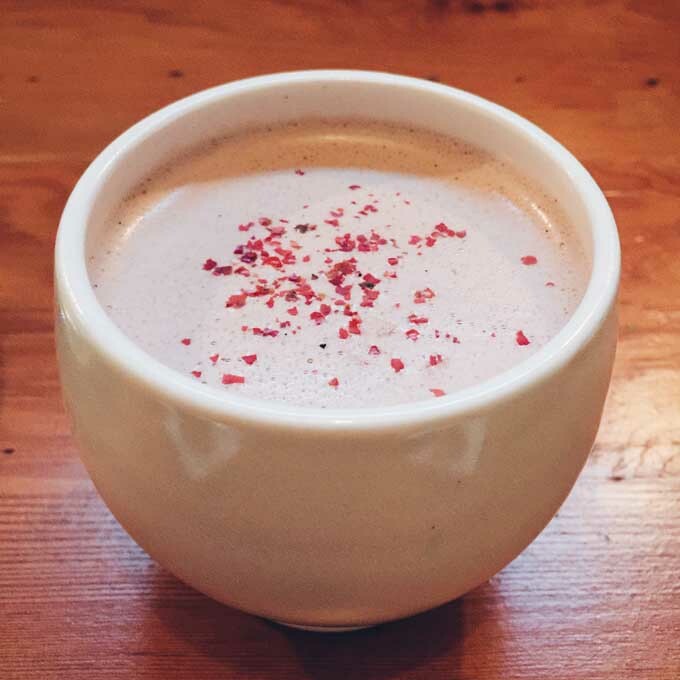 They also creates organic ‘bean-to-bar’ chocolate and organic drinking chocolate and coffees as well. 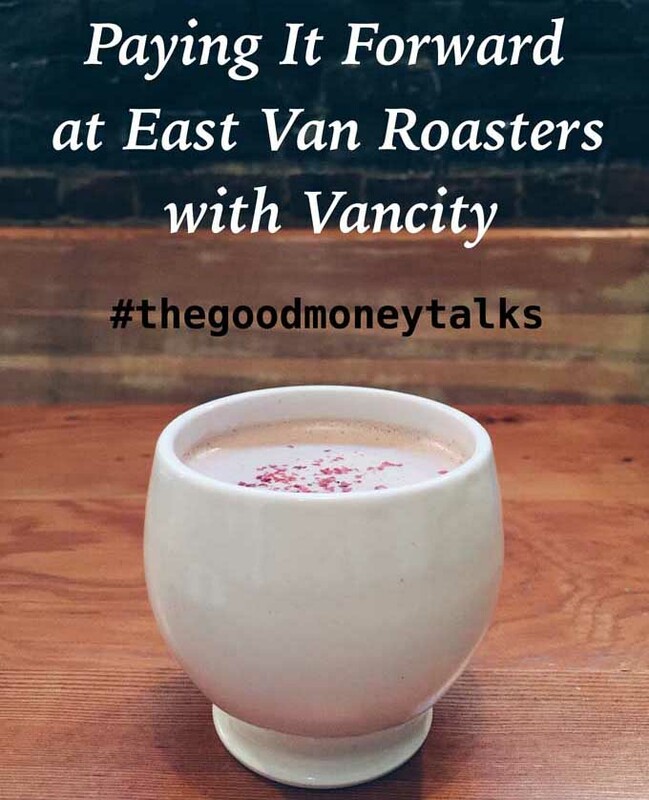 Their work is meaningful to the community and I thought that paying it forward at East Van Roasters would be worthwhile. 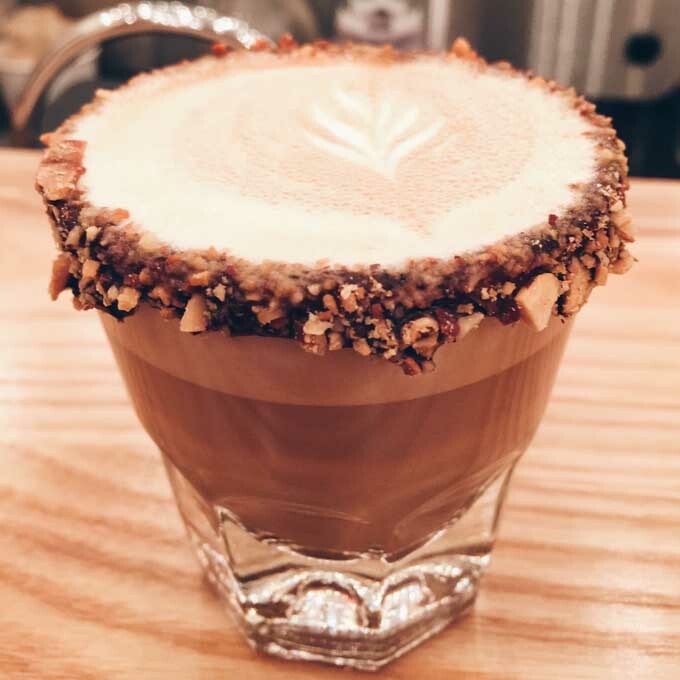 With the pay it forward amount, East Van Roasters is planning to have “suspended” drinks for residents of the Downtown Eastside community. The suspended drinks will be available until the amount runs out. I am looking forward to finding out how many suspended drinks were served! While I was there, I bought a Monkey Manna, which is Peruvian drinking chocolate with pink peppercorn and vanilla. It was creamy, wholesome, and delicious. 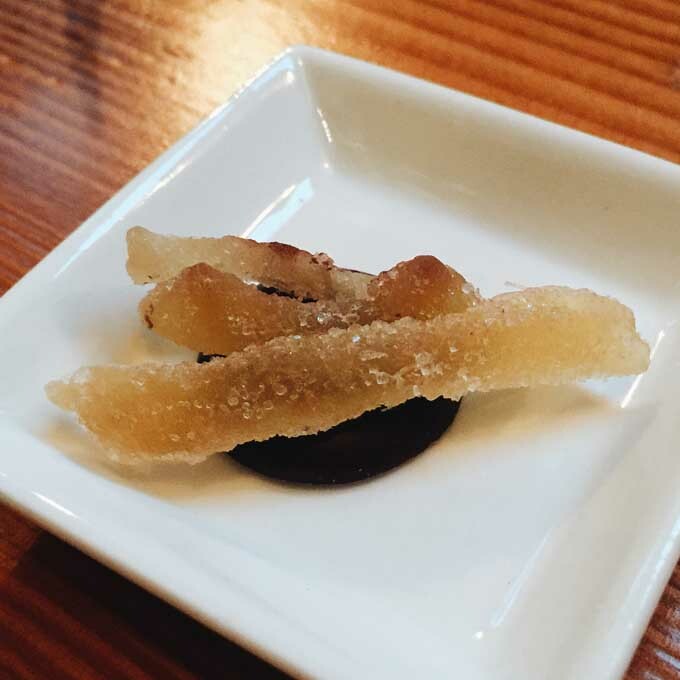 I also enjoyed the candied ginger mendiant…the ginger certainly gave me a jolt to my senses (in a good way). I liked the fig, almond, cranberry and pistachio mendiant, which seems very intricately put together! This was an overall positive experience in paying it forward. 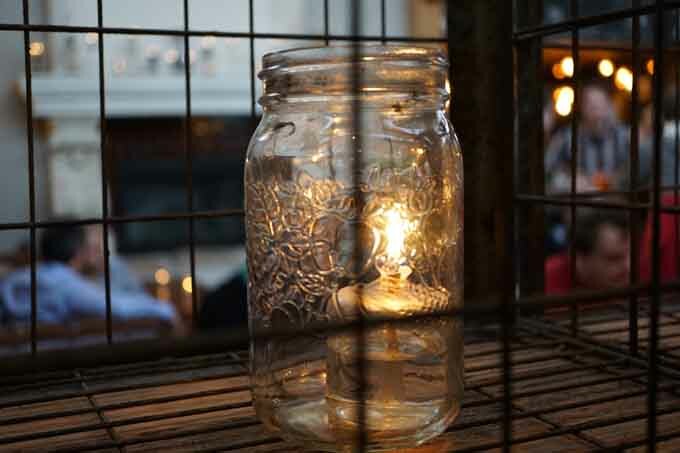 I appreciated Vancity in raising more awareness about paying it forward in our everyday lives. The other two winners had very meaningful pay it forward ideas: one supported Megaphone, an organization that provides meaningful employment to homeless and low-income individual; the other bought socks and distributed them to people in need. I decided to try out Moii Cafe after seeing a Social Shopper deal for $14 for savoury or sweet crepes and drinks for 2 people. 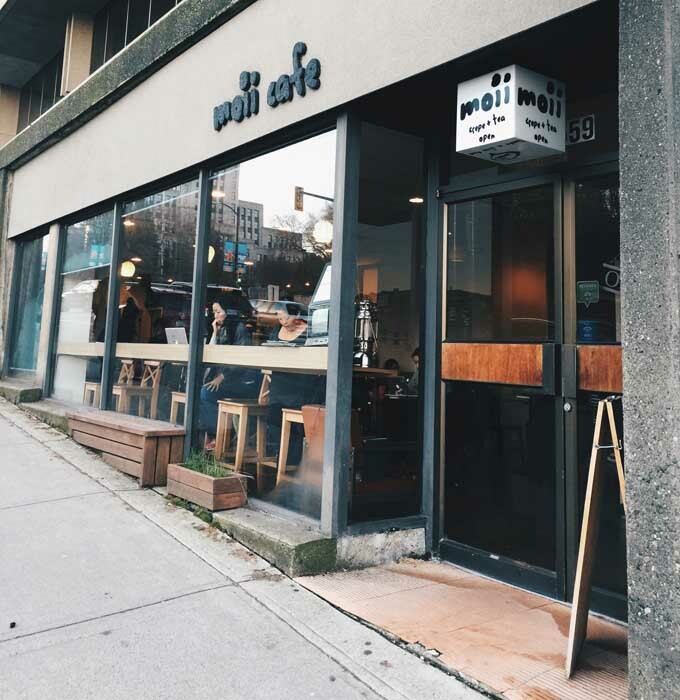 Moii Cafe is a crepes, desserts and bubble tea cafe next to popular La Taqueria on West Broadway and is across the Broadway Skytrain station. 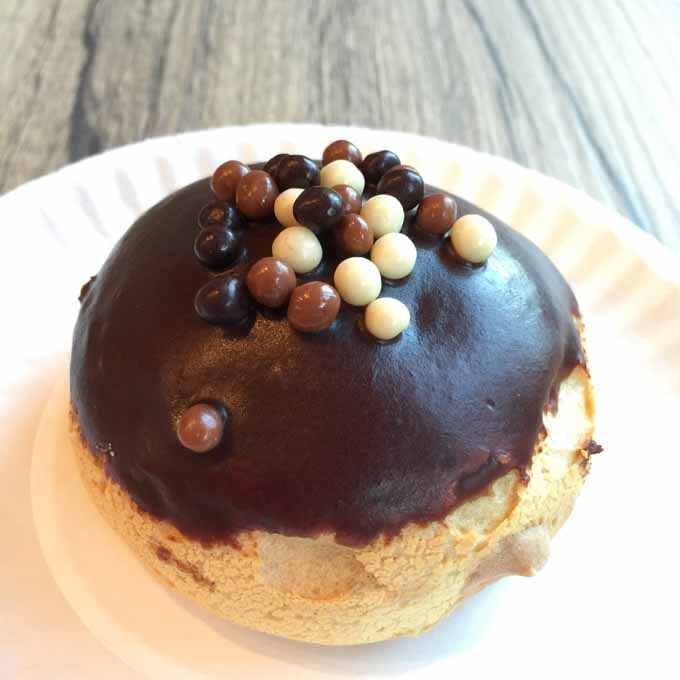 I visited Moii Cafe twice using Social Shopper vouchers. Moii seemed like a restaurant frequented by a younger or student crowd. There were some customers with text books and laptops. 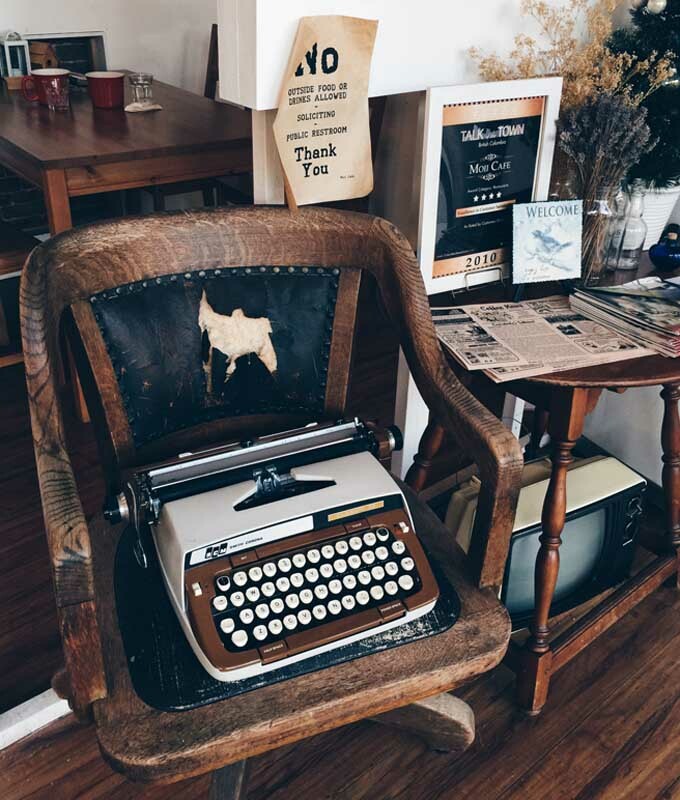 Vintage chair and typewriter are presented as decor pieces near the entrance. 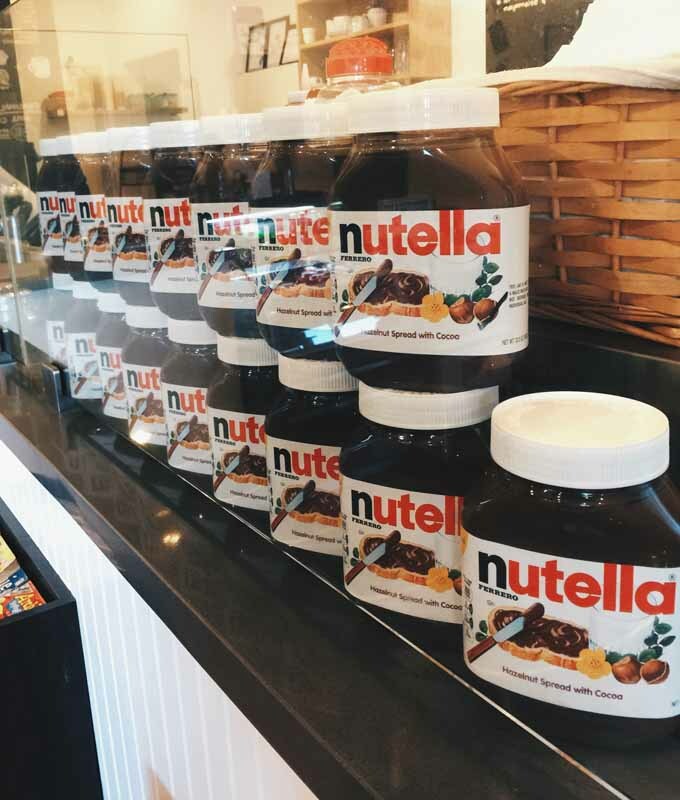 I like this this display of Nutella along their counter. For drinks, we ordered milk tea with jelly or pearls. I really loved the coconut milk tea with jelly. They also have coffee and smoothies as well. 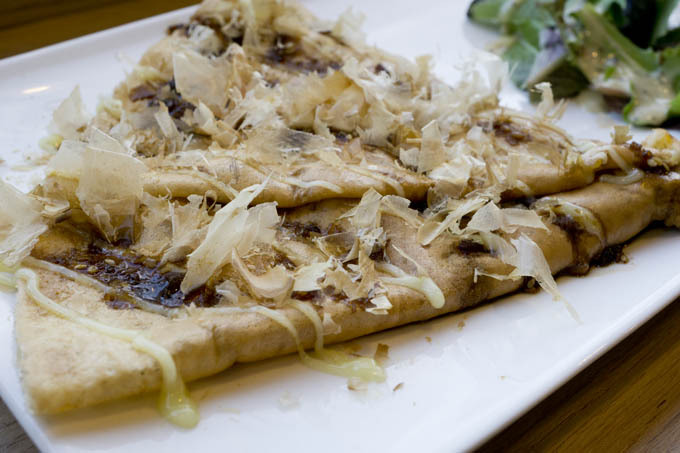 I tried the Terimayo savoury crepe: BBQ chicken, Bonito lakes, cheddar and mozzarella cheese, Okonomi Sauce and Wasabi. 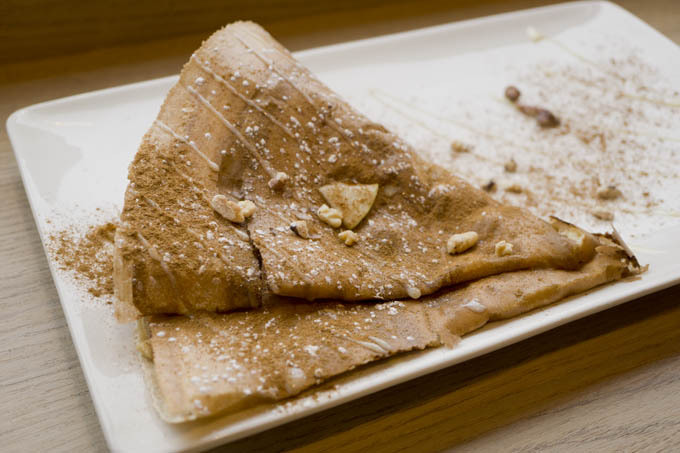 This asian-inspired crepe was delicious! 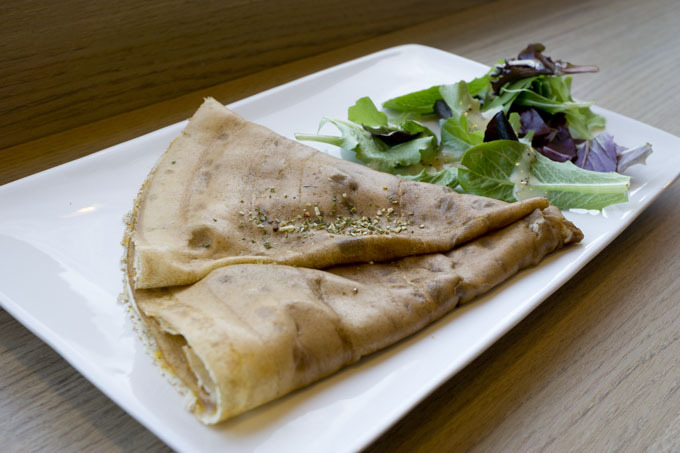 The Okonomi sauce made the crepe taste a bit sweeter. The Bonito flakes were deliciously crispy. My friend ordered the smoked salmon and cheese crepe. He thought it was pretty good as he had not thought that salmon and cheese would make a tasty combo. I enjoyed the caramel apple specialty sweet crepe made up of apple slices, walnuts, caramel, cinnamon, and condensed milk. It had the right amount of sweetness. The banana and Nutella crepe was delicious. I don’t think you can ever go wrong with this classic combination. 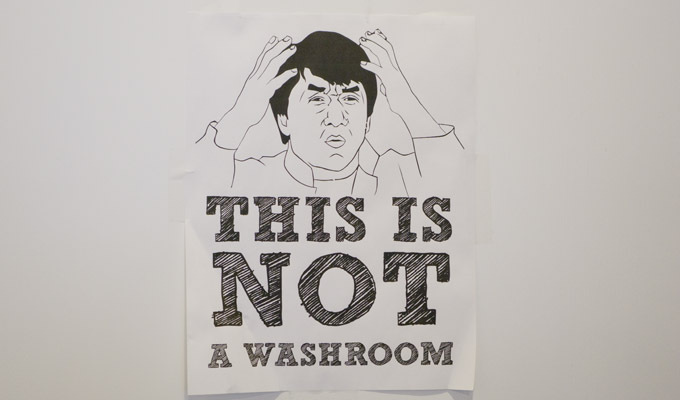 Jacky Chan tells you “This is Not a Washroom!” on one of the doors. 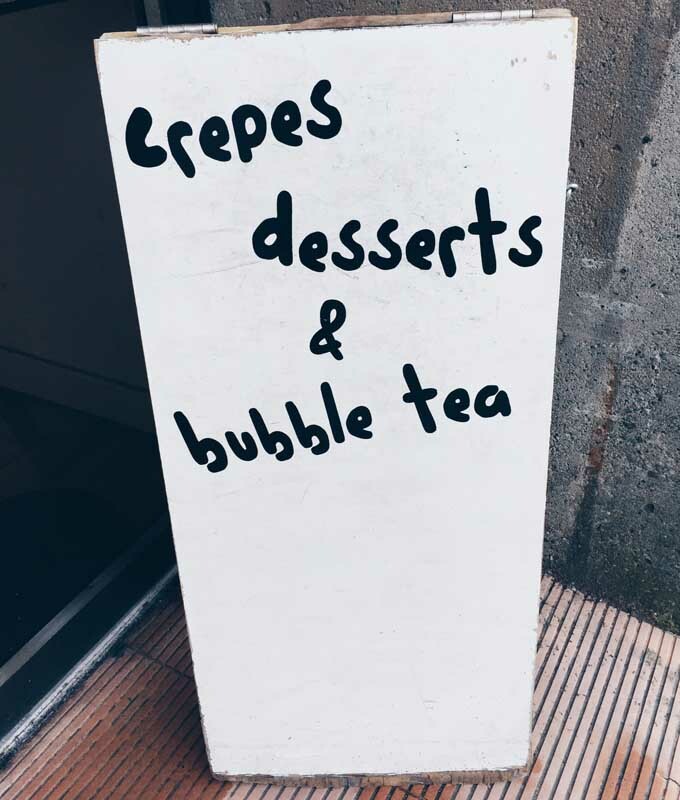 The staff person provided some helpful advice on crepe recommendations. Our crepes were delivered to our table within 10 minutes. 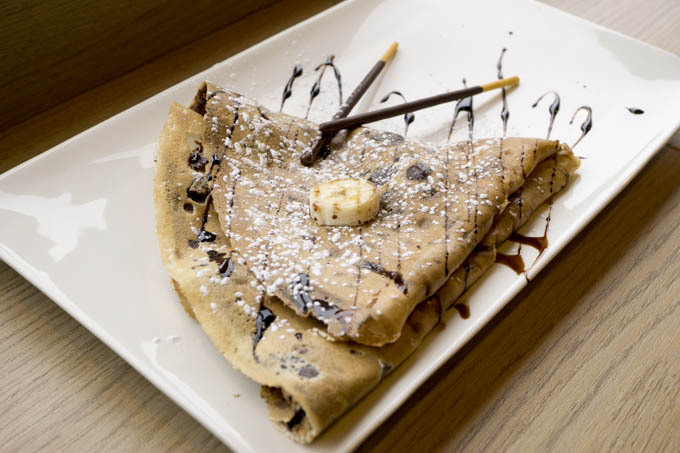 The crepes were tasty and we enjoyed the overall dining experience. 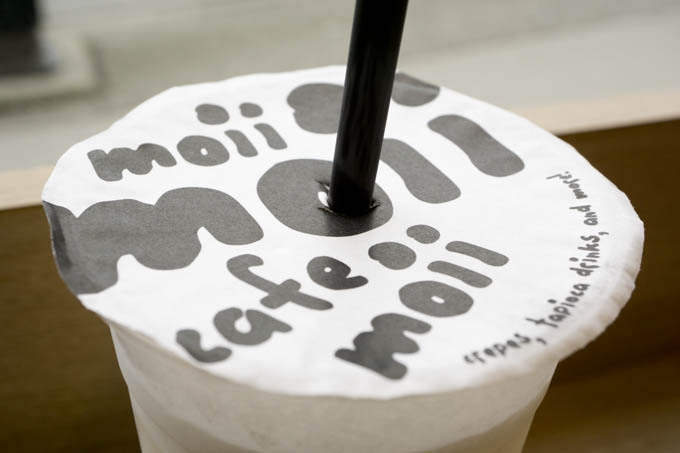 Moii cafe has a very relaxing vibe and I would recommend it for crepes and bubble tea. 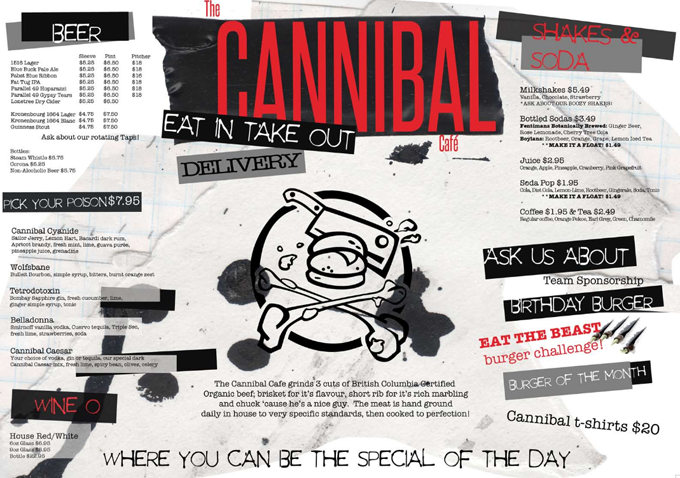 I was charged $1.25 for hot water at The Cannibal Cafe as a Dine Out Vancouver customer. I only found out after I got the bill. In my thirty-some years of life, I have never been charged for hot water at a sit-down restaurant. Me: You charge for hot water? Me: Is this in your menu? I did not appreciate the attitude of the server. It would have been better if she said something along the lines of, “Unfortunately, this is our policy.” Here rather non-nonchalant remark did not make it better. 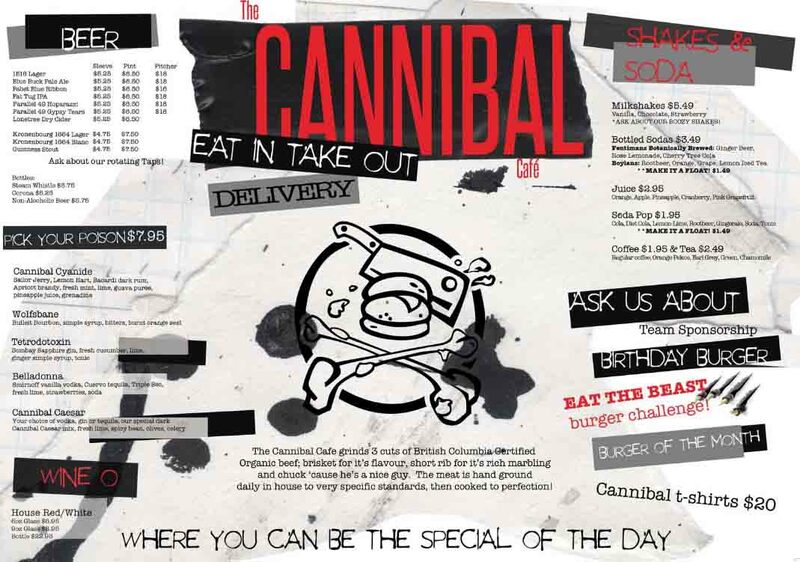 Prior to visiting The Cannibal Cafe, I checked their menu online to plan what to order. 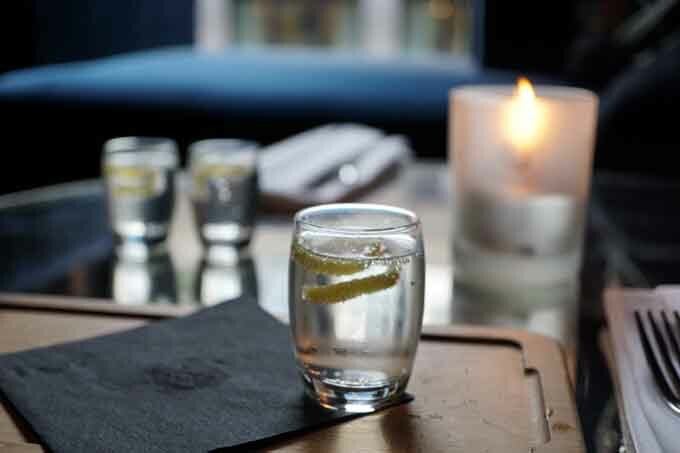 Below is a screenshot of their drinks menu online. Their Eat In/Take Out/Delivery drinks menu online does not show that they charge $1.25 for hot water. Obviously, there is a discrepancy between their online menu and their menu at the restaurant. 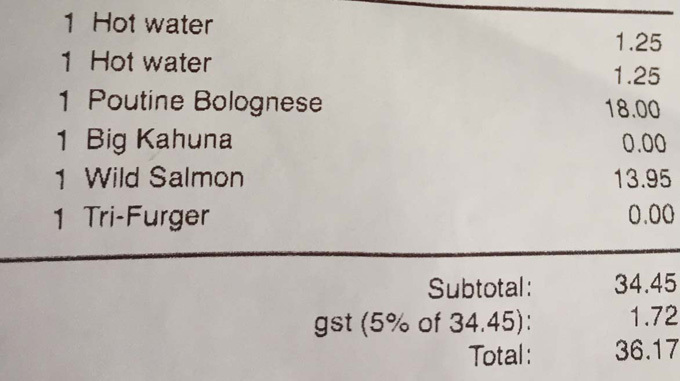 So Dine Out Vancouver customers get charged for hot water? But we got charged two hot waters when my husband ordered from the regular menu..Is this how you treat Dine Out customers by sneaking in different costs for drinks? I don’t get it. I really…don’t. 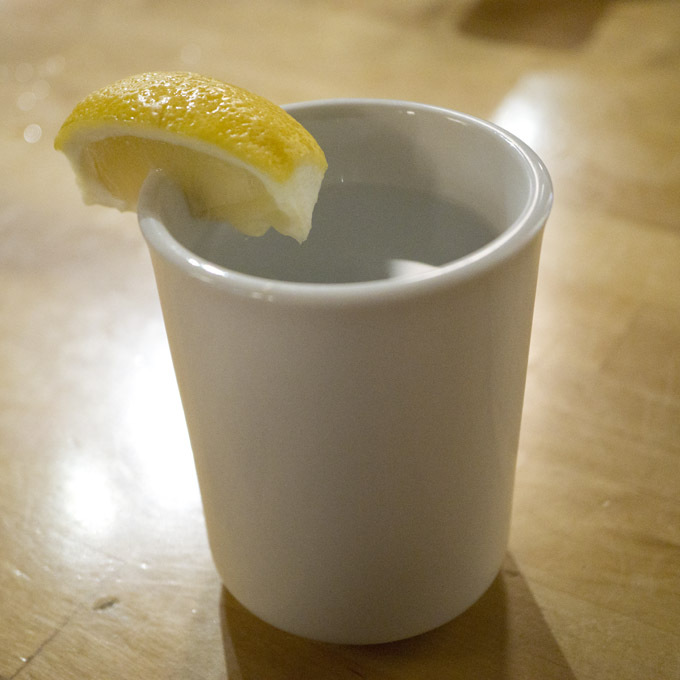 As a Dine Out customer, I need to be incurred $1.25 for hot water whereas regular customers do not. I feel like a second class citizen. Won’t return to this restaurant. Won’t recommend it. Won’t go back for the $2.50. 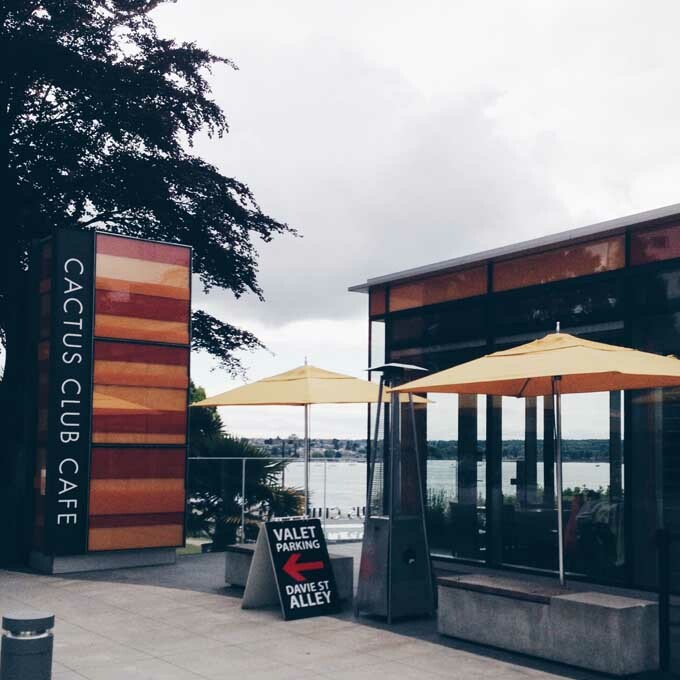 A little #throwback post here today from my dining experiences at Cactus Club Cafe English Bay last summer. First and foremost, I believe that this Cactus Club location has a lovely patio which provides lovely views of the ocean. 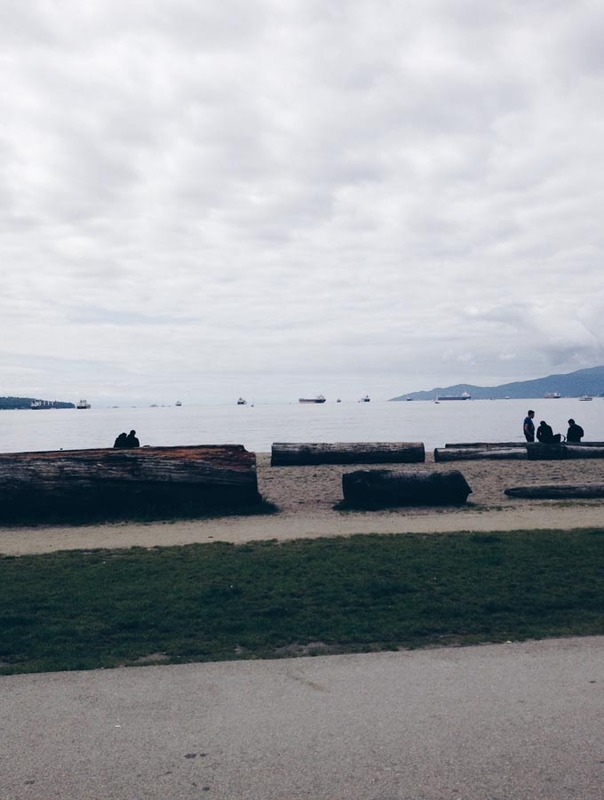 On a summer day, it is nice to look yonder at the people on the beach or enjoying their walk/run/bike ride along the seawall. 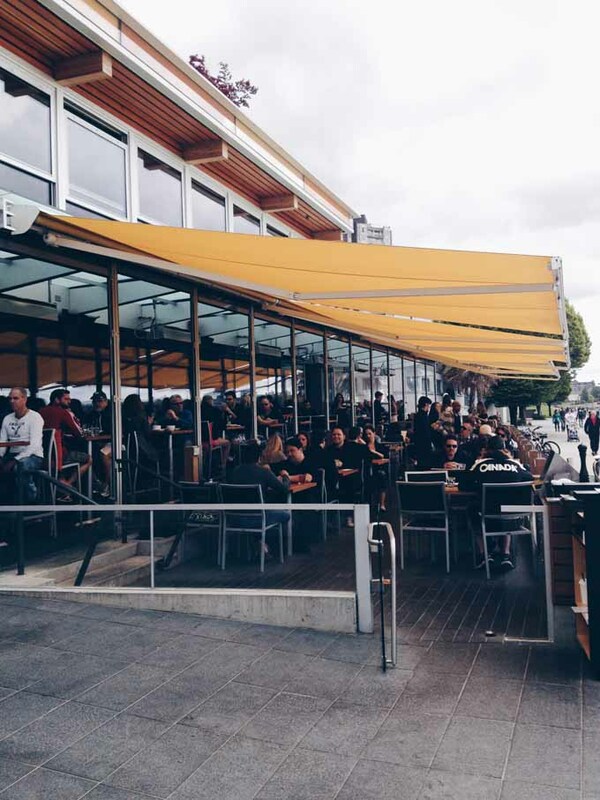 You can enter the patio at the seawall level. I came here with two others for a patio dining experience and shared all the plates we ordered. We first had the szechuan chicken lettuce wraps with sweet and spicy szechuan glaze, peanuts, wontons, korean chili sauce, spicy yogurt. They were so delicious – crunchy and just the right balance of sweet and sour. 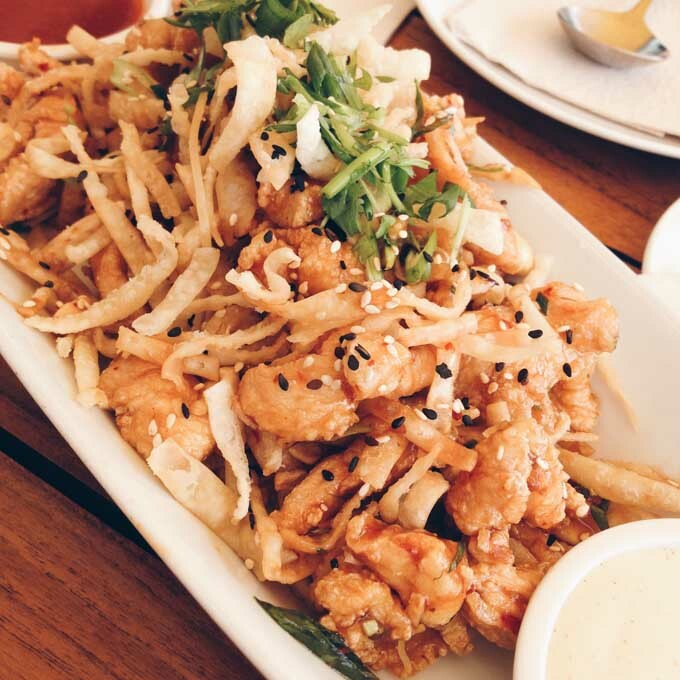 I would recommend this asian-inspired starter. 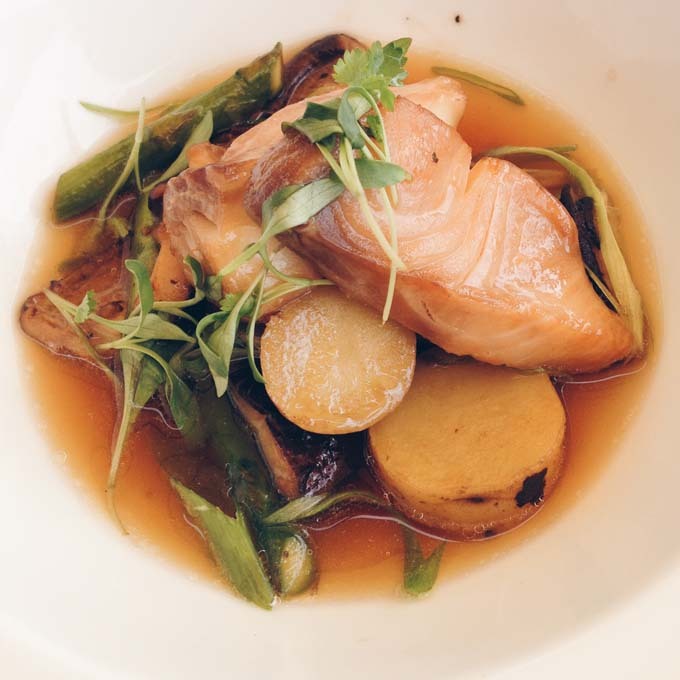 Next, we had the sablefish with shiitake mushrooms, asparagus, peking duck broth, and fingerling potatoes. I have always loved this fatty fish, and Cactus Club does an excellent job with this dish. 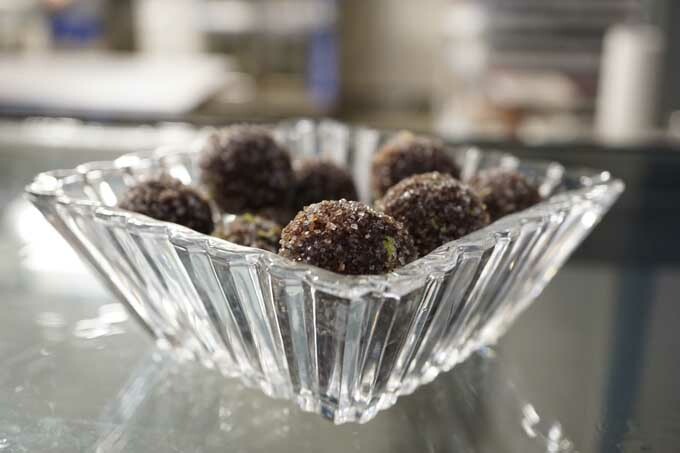 It is a bit of a slightly sweeter tasting dish – just the way I like it! Finally, we had the cheddar bacon burger with smashed certified angus beef®, aged cheddar, smoked bacon, red relish, mayonnaise, ketchup, and mustard. The burger was very tasty with a nice and juicy angus patty. 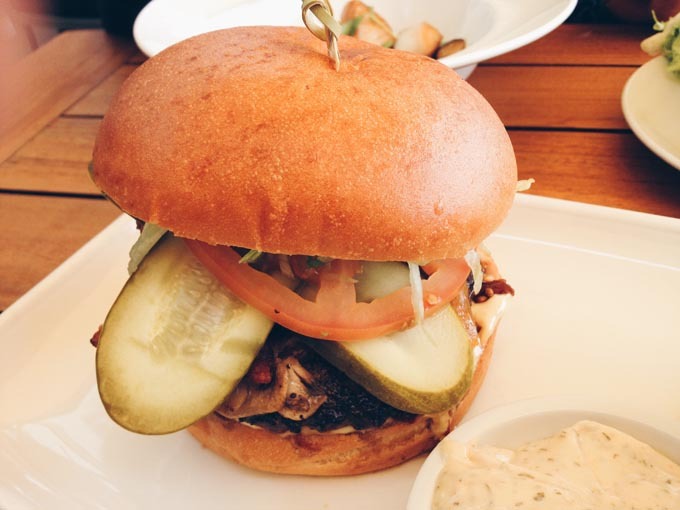 The overall dining experience at Cactus Club English Bay was enjoyable. Our server was attentive and we felt the service was good. 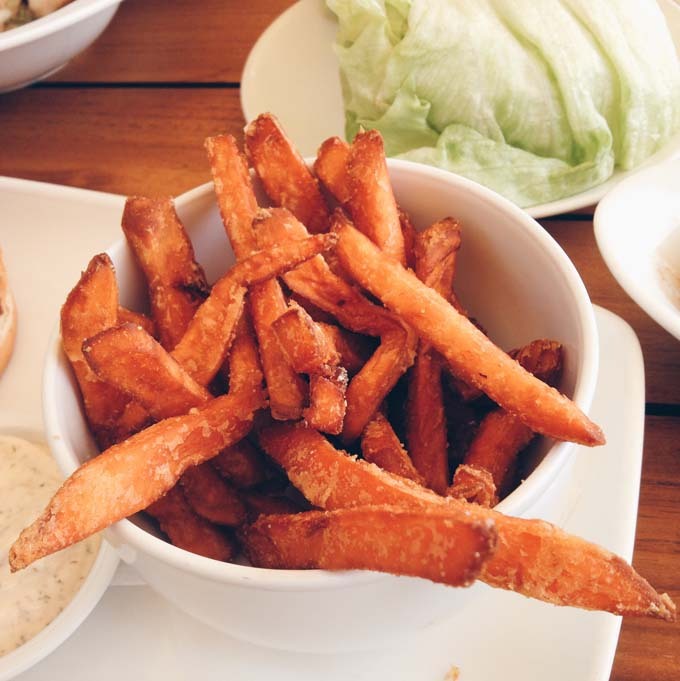 You can enjoy Cactus Club food at any of their locations, but Cactus Club English Bay restaurant has the added bonus of a fantastic ocean view while you are dining.